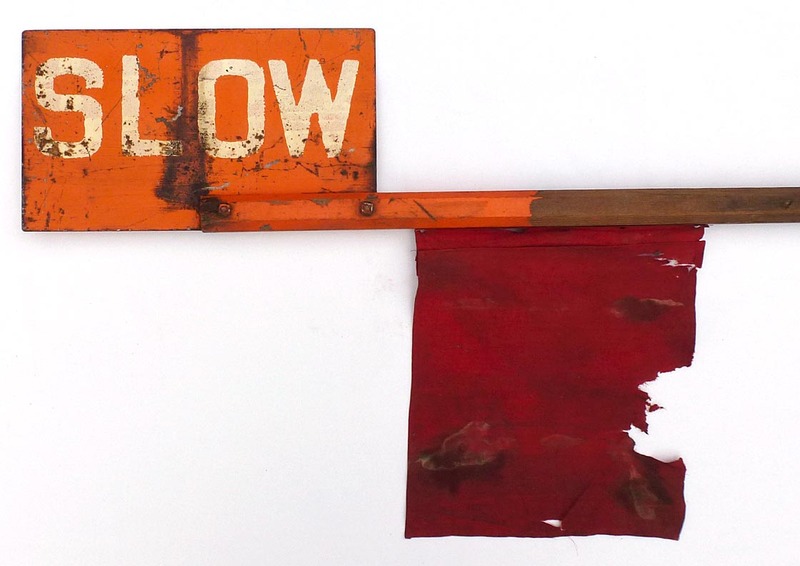 Signs, Banners, and Cutouts at Artisans Folk art, antiques, and outsider art Gallery. CALL 256-886-2809. 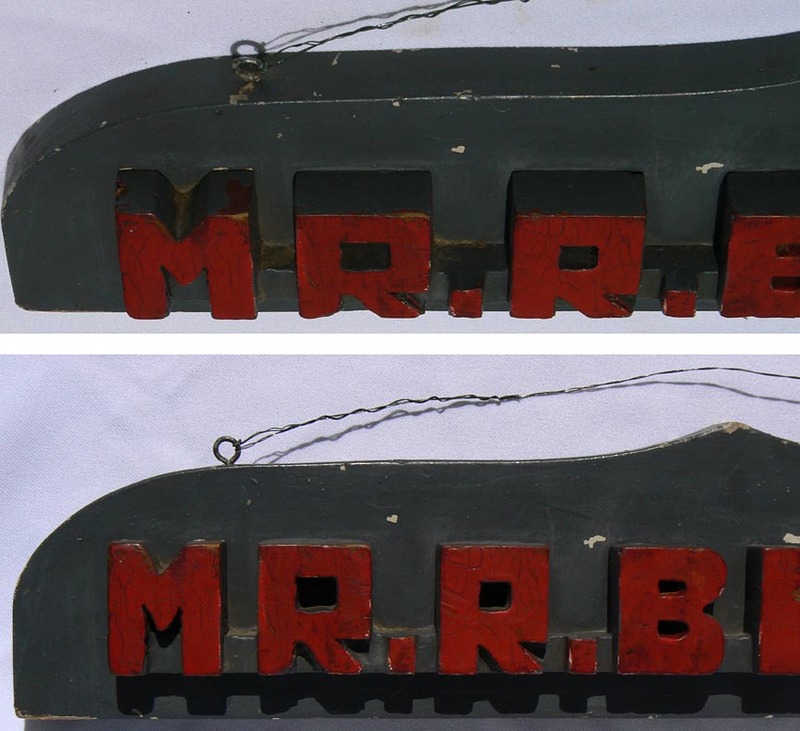 This is a wood sign with applied wood letters that reads "Mr. R. Blight". It is painted dark gray with red letters, and has two eyes on top for hanging. It can also sit on a desk or shelf. 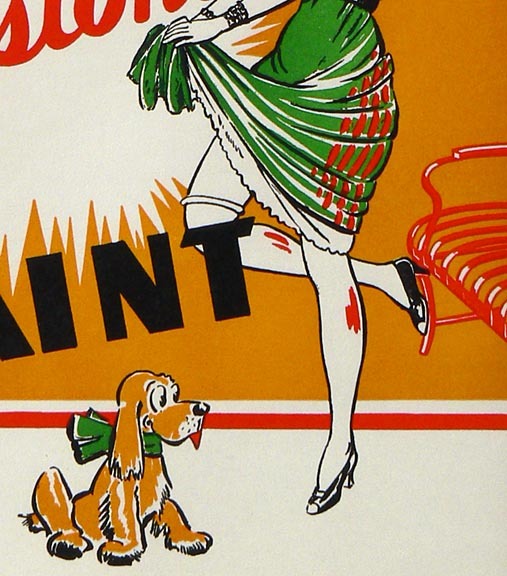 The red paint has a crazed surface. This sign measures 21" wide by 4 1/2" high by 1 1/2" deep. 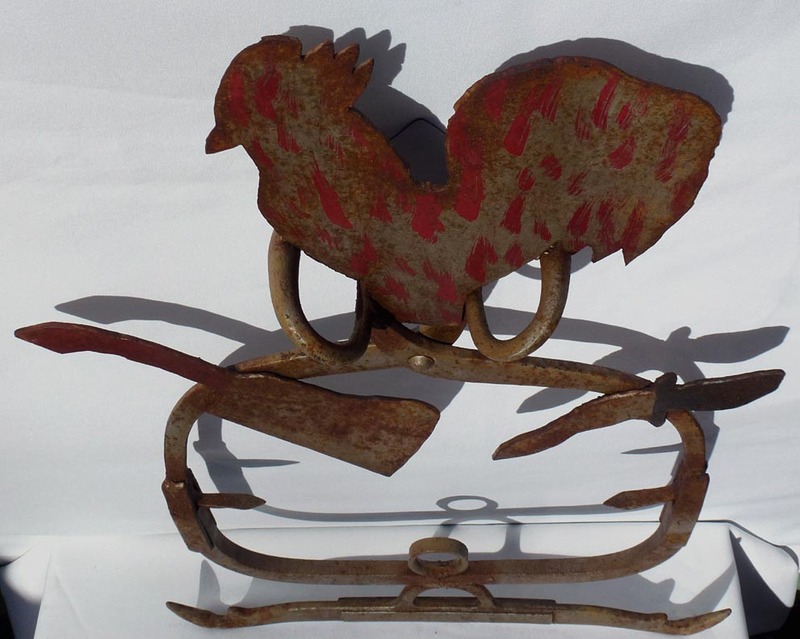 It was probably made in the 1940's or earlier, and is in good condition with some paint wear and a few small chips. The price is $185.00. Inventory Code: THTW. "Mr. R. Blight" sign ... Closeups ... Another closeup ... From above ... Closeup from above ... From below ... Back. This is a folky butcher's trade sign. 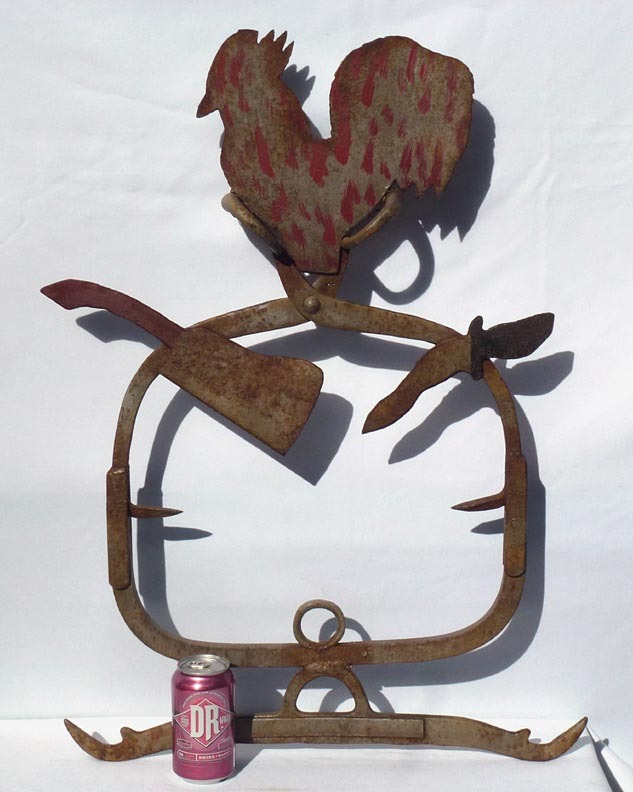 It is hand made from metal tools and found objects, with a sheet metal rooster on top. Ice tongs form part of the frame. 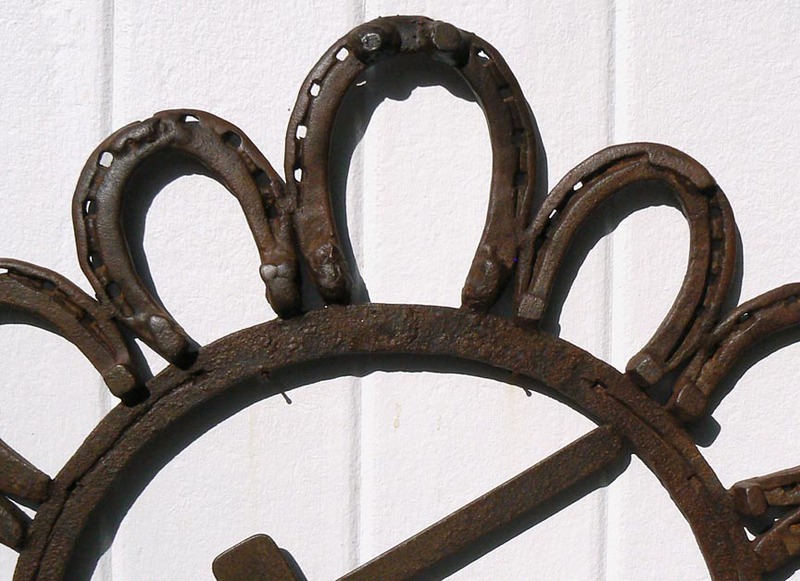 It has worn silver paint with areas of surface rust. Red and black decoration was added on one side. 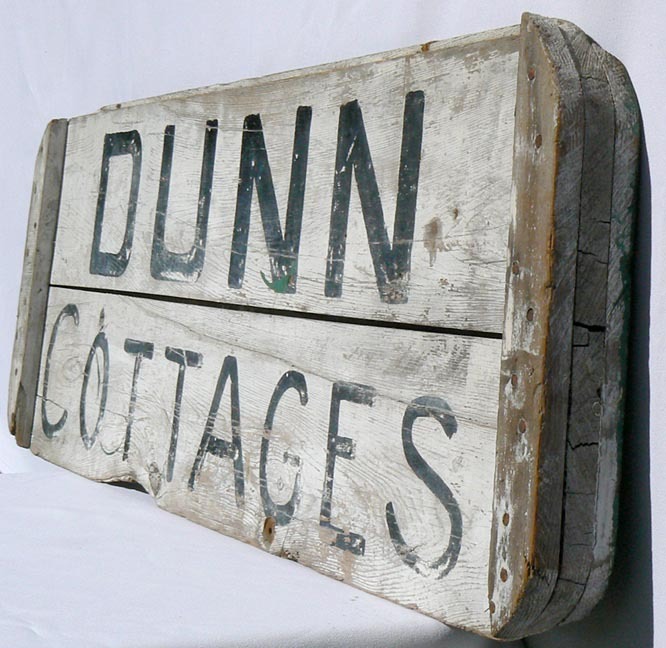 From the first half of the 1900's, it measures 30" high by 22" wide by about 5" deep at the tong handles, in very good, weathered condition. The price is $1500.00. Inventory Code: CCRS. Folky butcher's trade sign ... Closeup ... The other side ... Side views ... From above ... With a soda can for scale. 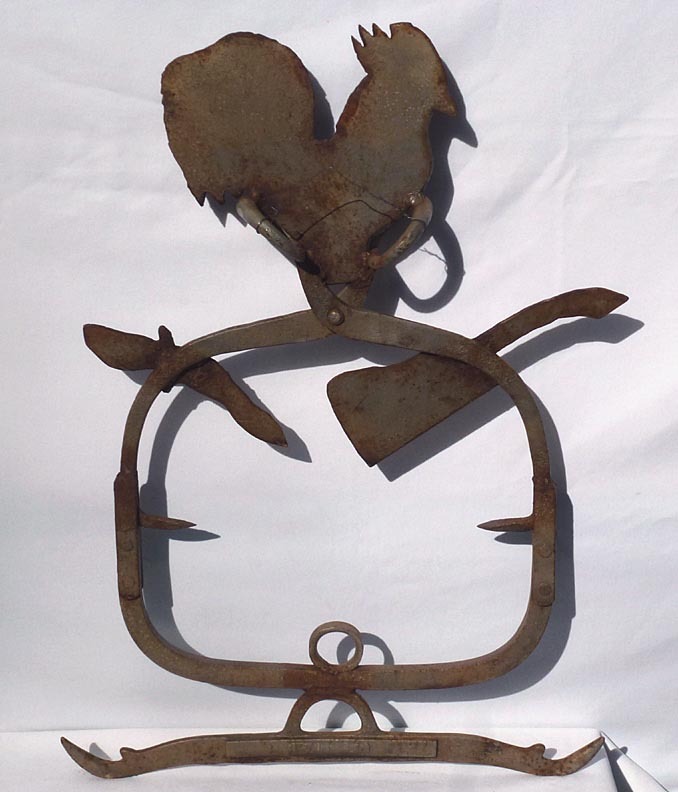 Some much larger photos: Folky butcher's trade sign ... Closeup ... The other side ... Side views ... From above ... With a soda can for scale. This is a large, 3-dimensional, Op Art "Universe" sign. 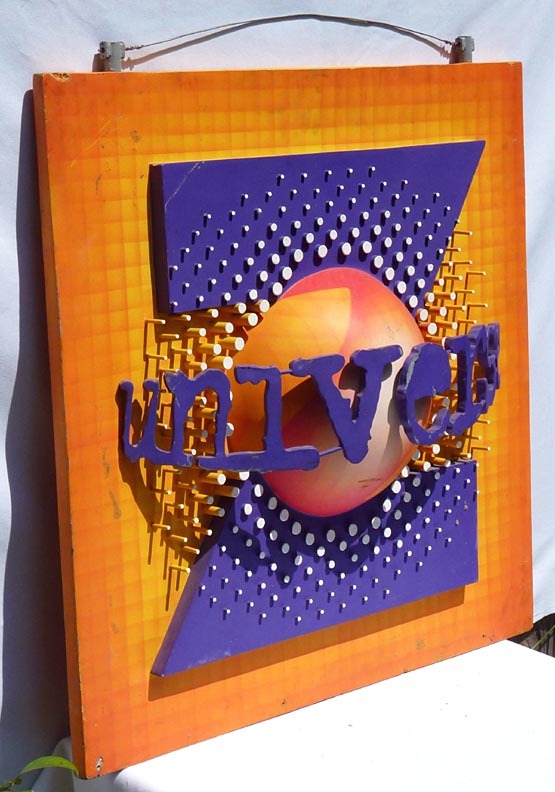 It is made of fiberglass and various sized wooden dowels, with vibrant paint. 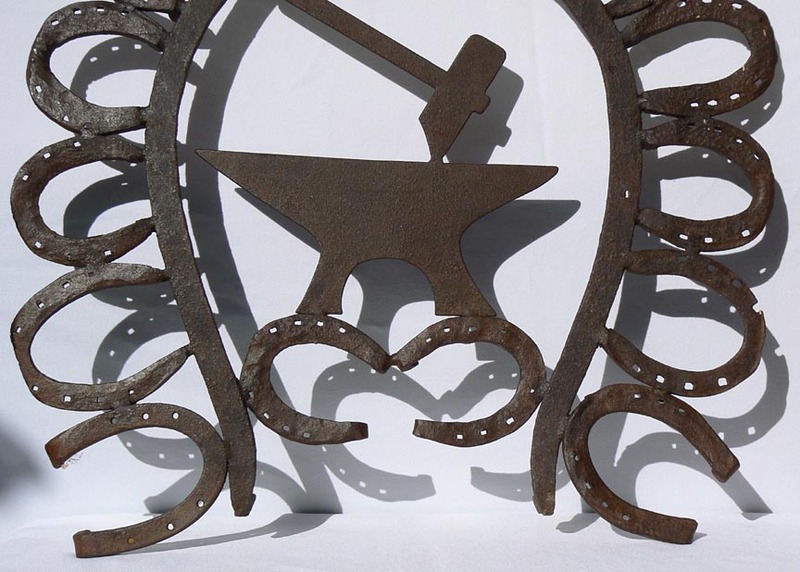 The word arches over the central half-globe, while the graduated dowels also project out from the background. 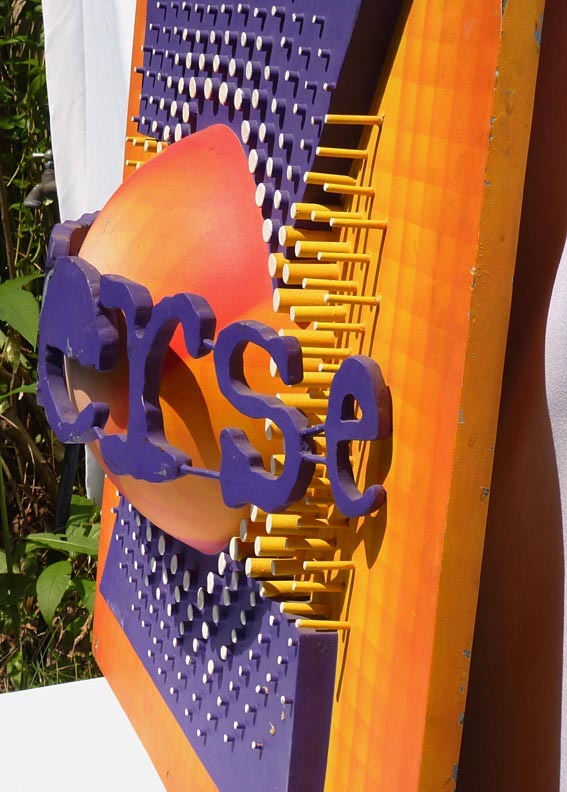 The sign is 33" square by about 5 1/2" deep; the mounting brackets on top add another 1 1/2" to the height. 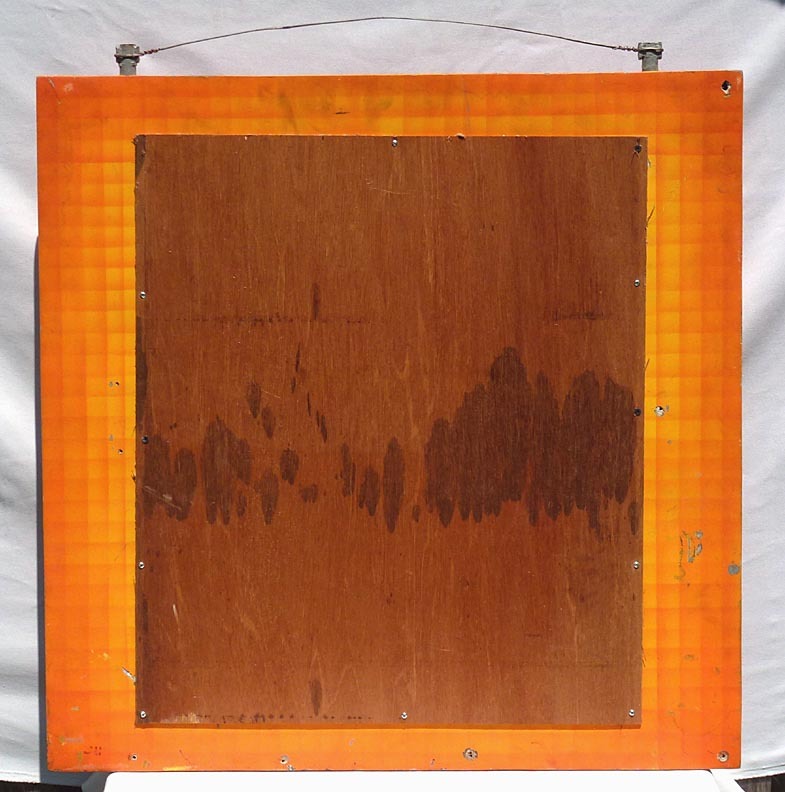 The overall condition is good, with some paint loss, stains, chips around the edges, a gouge in the lower part of the globe, and two broken dowels in the lower right. It is from the late 20th or early 21st century. The price is $425.00. Inventory Code: TRCP. 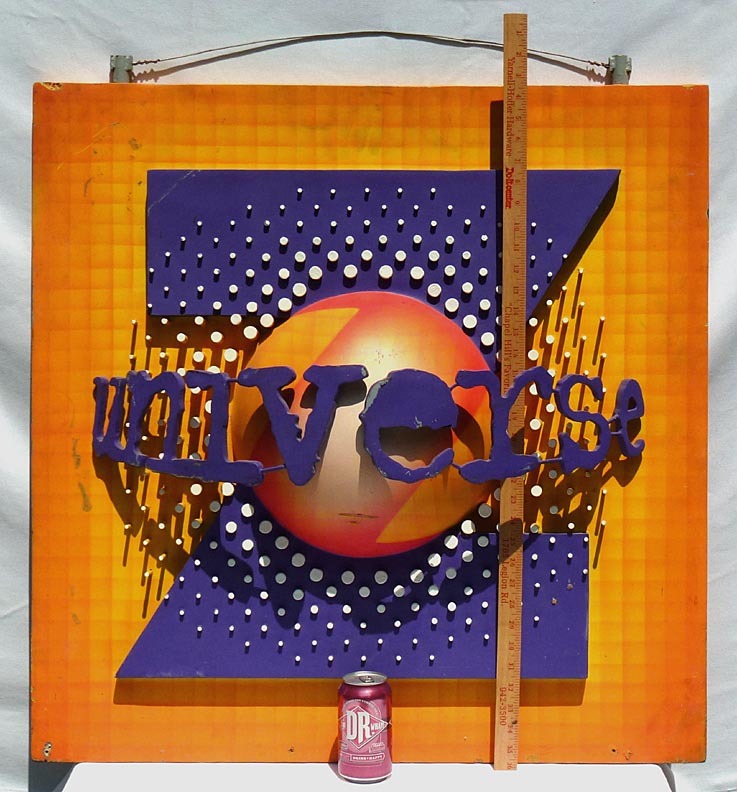 See a slideshow of several views [1.1 Mb] ... Universe sign ... Side view ... The other side ... From above ... Another view from above ... Closeup, upper left ... Upper right ... Lower left ... Lower right ... Closeup center ... From below ... Closeup from side ... Closeup, other side ... Back view ... Another view from back ... With a yardstick and soda can for scale. 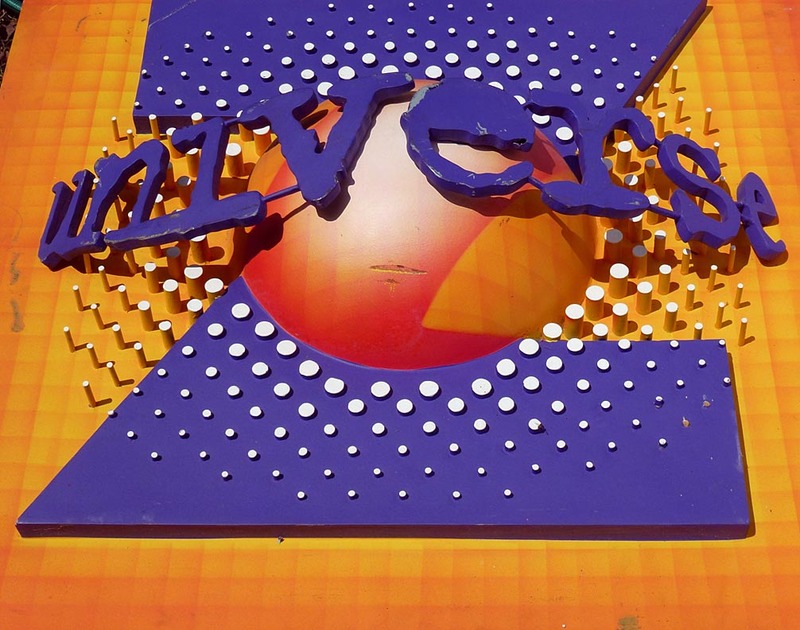 Some much larger photos: Universe sign ... Side view ... The other side ... From above ... Another view from above ... Closeup, upper left ... Upper right ... Lower left ... Lower right ... Closeup center ... From below ... Closeup from side ... Closeup, other side ... Back view. This is an old "Wet Paint" sign with great graphics. 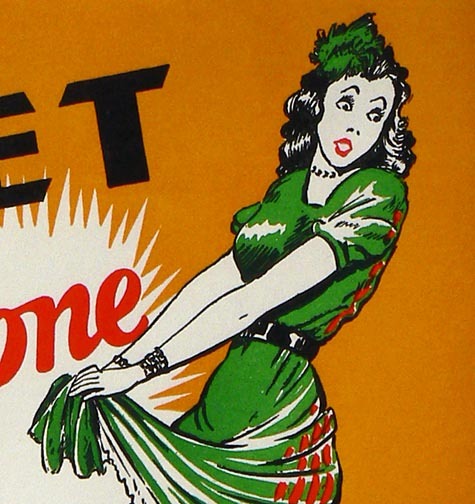 It probably is from the 1940's. 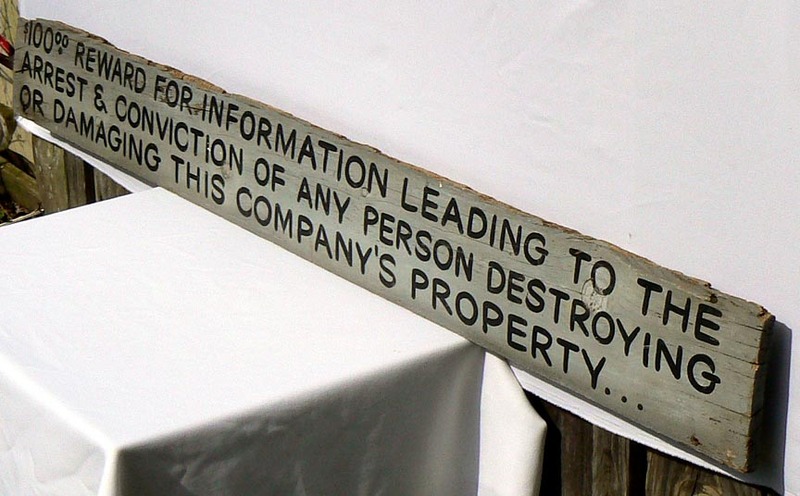 This sign is printed on a heavy card stock in a black wood frame. 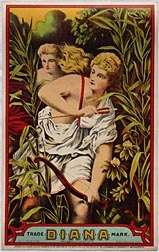 The image is 8 5/8" by 12 1/4" while the overall size of the frame is 11" by 14 5/8". There are five available. They are $65.00 each. Inventory Code: TCAC. 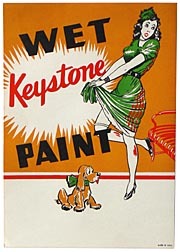 Keystone paint sign ... Overall, with the frame ... Closeup ... A second closeup ... Side view. 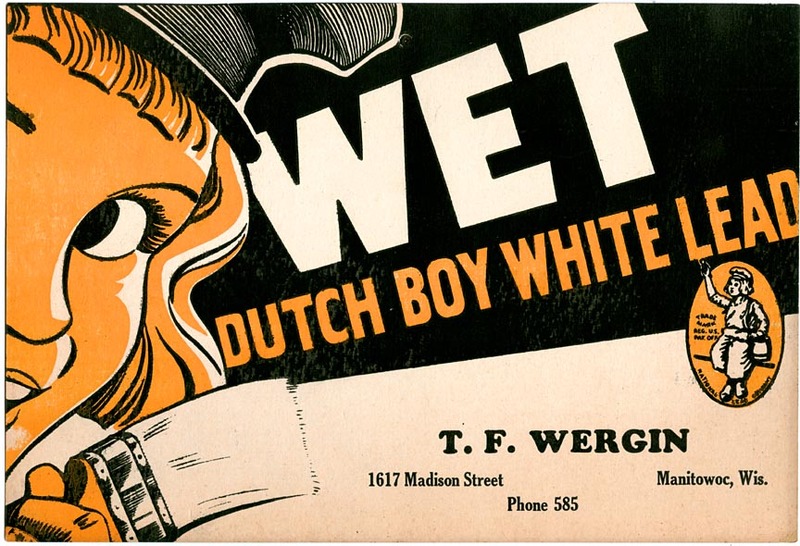 This is a very graphic old "Wet Paint" sign for Dutch Boy white lead paint. It is not dated but came with some others from 1934 and '36. 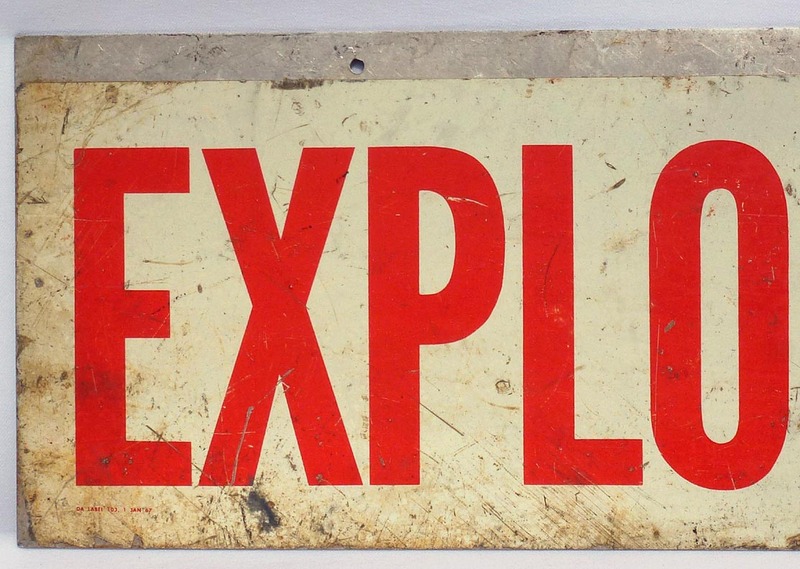 This sign is printed on a heavy card stock, in a black wood frame. The condition is very good. The image is about 7 1/4" by 10 1/2" while the overall size of the frame is 9 3/4" by 12 3/4". There are three available, and they may be purchased with or without frames. The price is $45.00 as framed or $35.00 without the frame. Inventory Code: TCTR. Dutch Boy wet paint sign ... With the frame ... Side view. 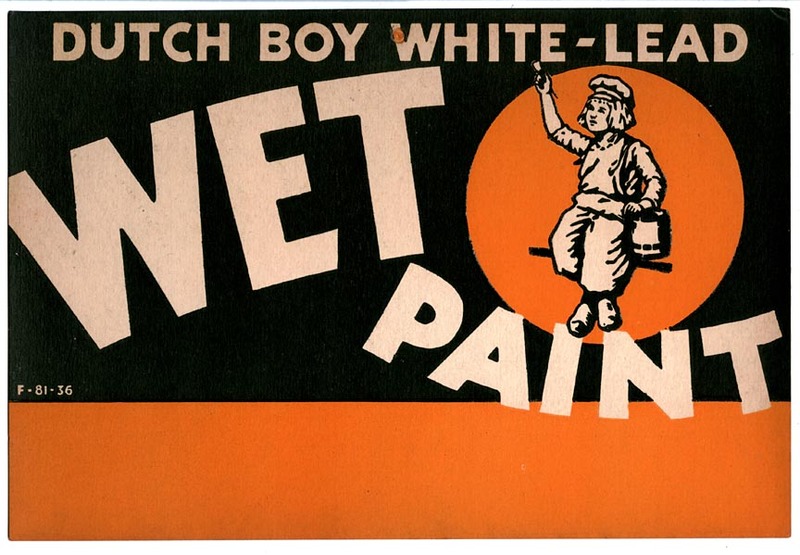 This is an old "Wet Paint" sign for Dutch Boy white lead paint. It is dated 1936. 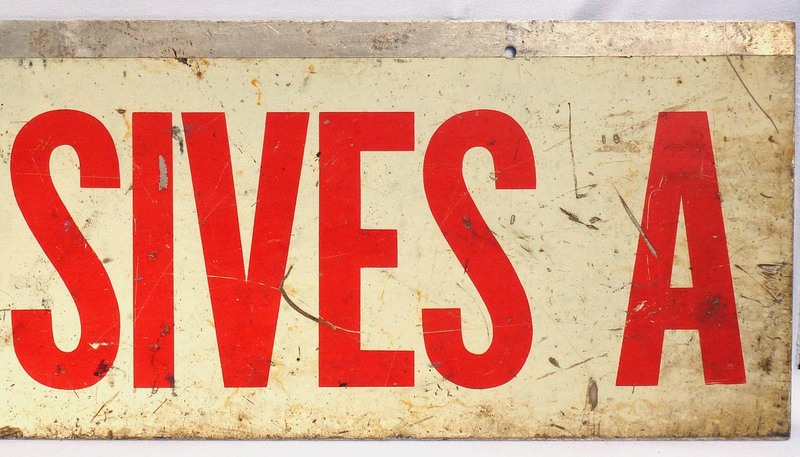 This sign is printed on a heavy card stock, in a black wood frame. The condition is very good. The image is about 7 1/4" by 10 1/2" while the overall size of the frame is 9 3/4" by 12 3/4". 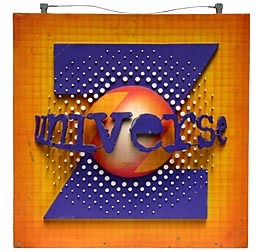 There are seven available, and they may be purchased with or without frames while our supply of frames lasts. The price is $40.00 as framed or $30.00 without the frame. Inventory Code: TCTP. 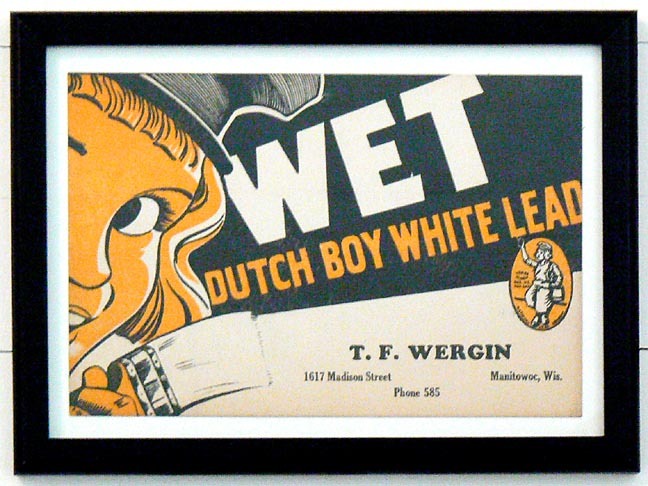 Dutch Boy wet paint sign ... With the frame ... Side view. 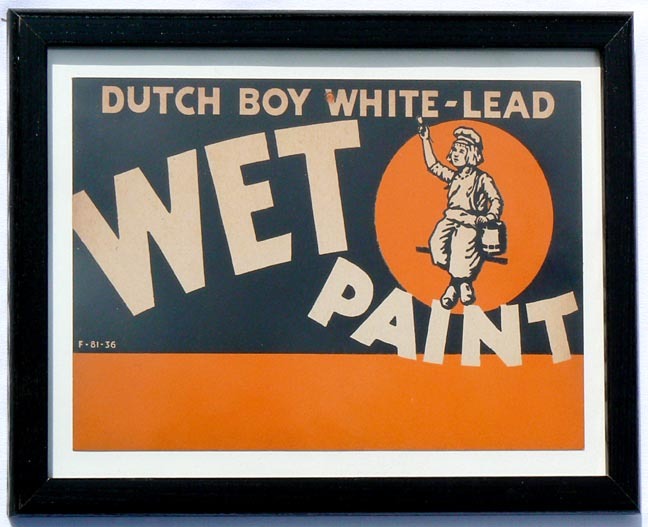 This is an old "Wet Paint" sign for Dutch Boy white lead paint. It is dated 1934. This sign is printed on a heavy card stock. The sign is about 7 1/4" by 10 1/2". 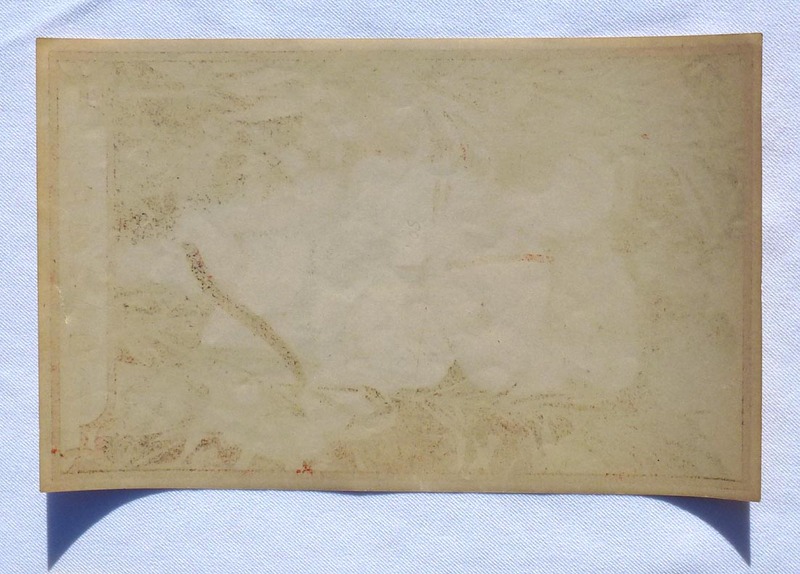 It has a minor crease across one corner, and foxing along one side as visible in the photos. 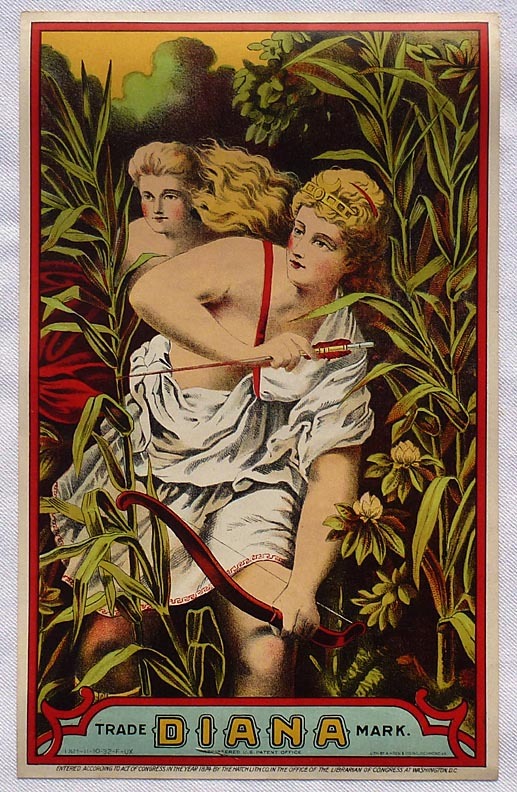 It is unframed, or may be ordered in a black frame similar to the other paint signs, while our supply of frames lasts. The size if framed would be 9 3/4" by 12 3/4". The price is $25.00 as is, or $35.00 framed. Inventory Code: TCTS. 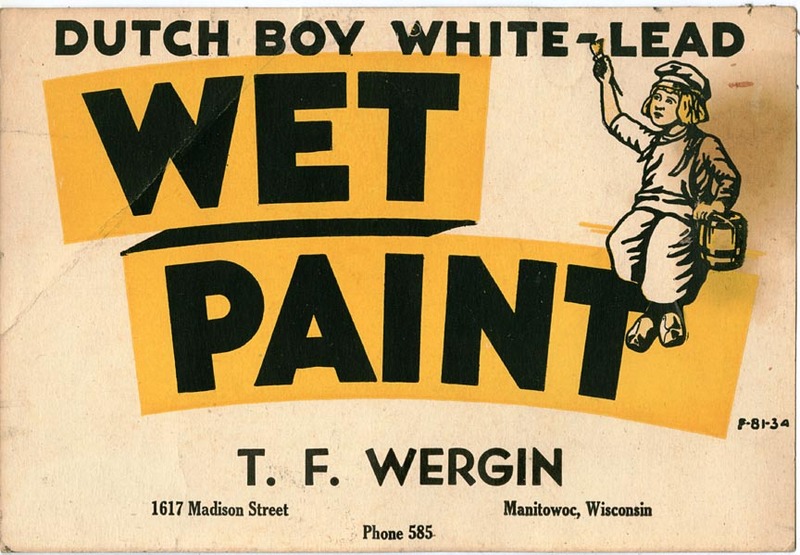 Dutch Boy wet paint sign. Here is a collection of oversize keys. 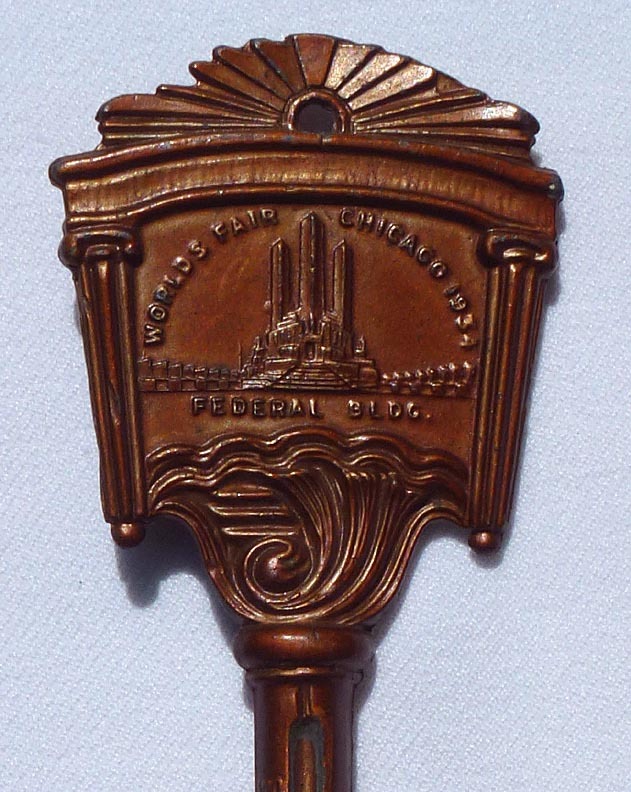 There are trade signs, ceremonial "keys to the city", and souvenirs. They range in age from the late 1800's through about the 1940's, and in size from 8" to almost 5 feet long. They are described and priced separately below, with a discount for buying several - they look great together. See a slideshow of several views [987k] ... 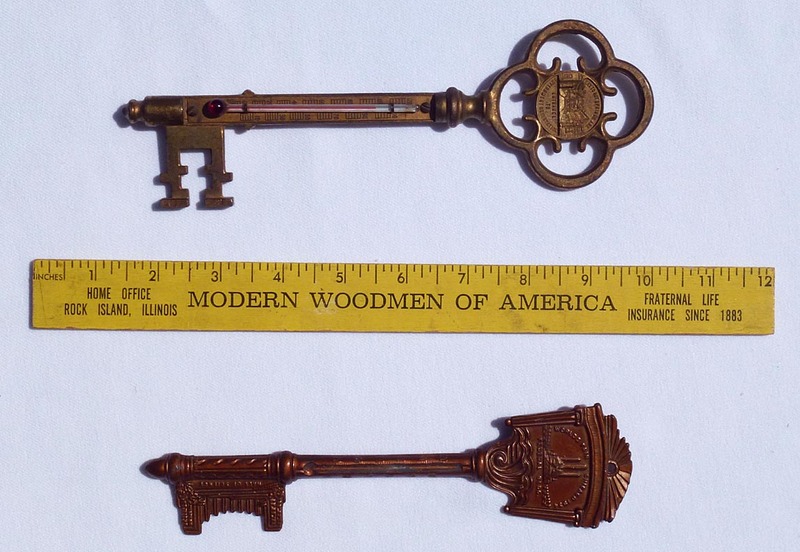 The largest key, with a yardstick ... Several wood and metal keys ... Two wood keys ... Three large metal and wood keys. 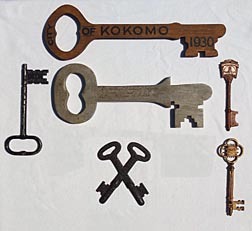 The largest key, with a yardstick ... Several wood and metal keys ... Two wood keys ... Three large metal and wood keys. 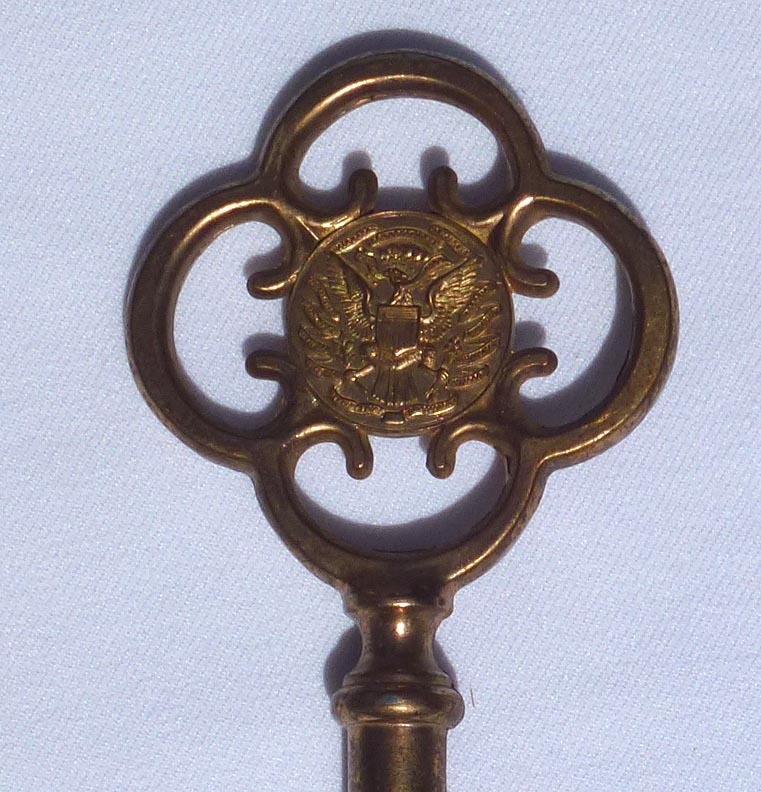 This is the largest and most intricate of the keys. 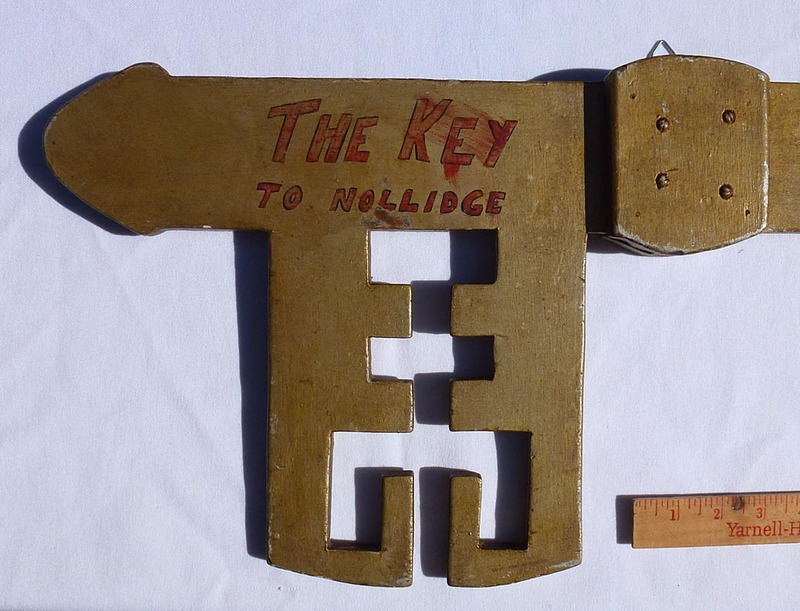 It has the delightful inscription "The Key to Nollidge" "With all best wishes for many Happy Days (and Nights) RDL" "21 today (and tomorrow)". 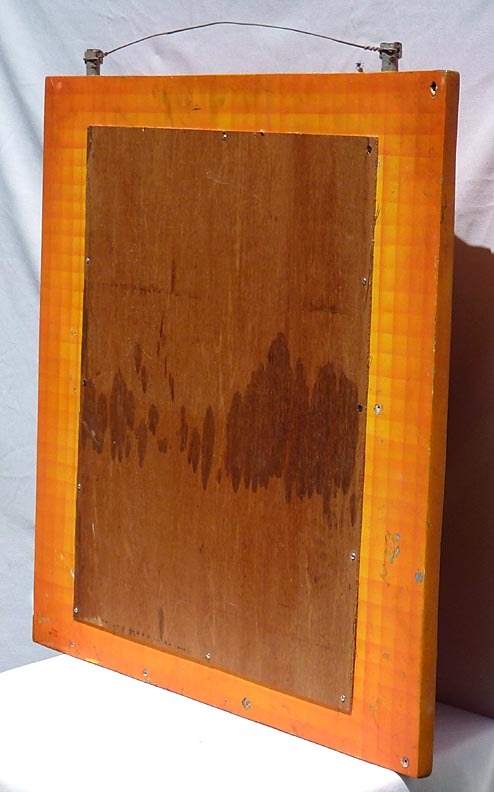 It is pieced from plywood, and measures 57 1/2" long by 14" high by 1 1/2" at the thickest. The paint is silver and gold, with red and black lettering. 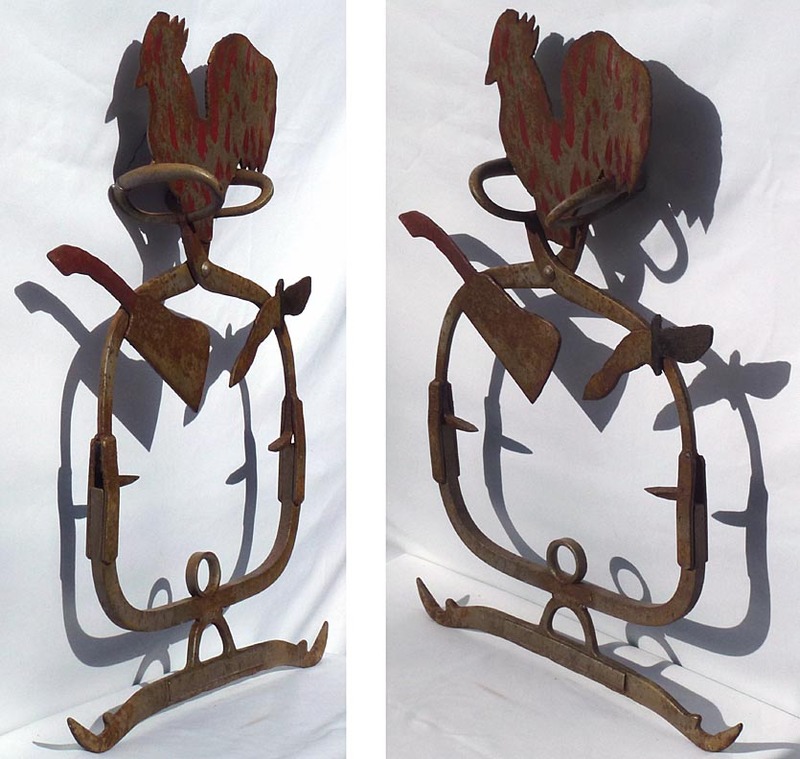 Two newer metal hangers have been attached to the back. 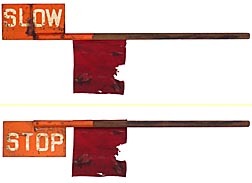 There is some wear and paint loss, especially around the edges, and some of the red paint has smeared. The age appears to be from about the 1920's to 40's. The price is $850.00. Inventory Code: CTPC. 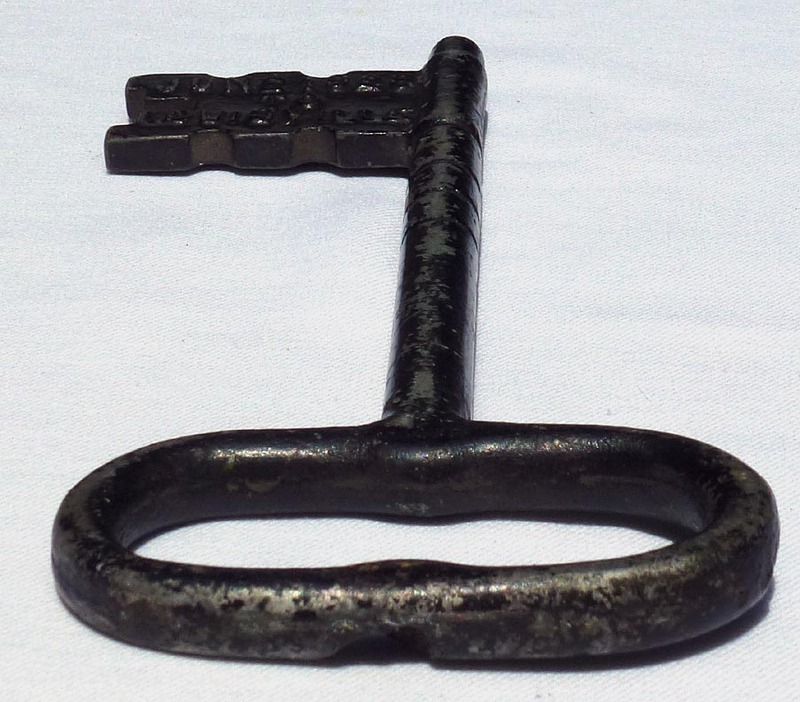 The largest key, with a yardstick ... Closeup ... Closeup, other end ... From above and below ... End view ... Back view ... Closeup of back ... Second closeup of back. 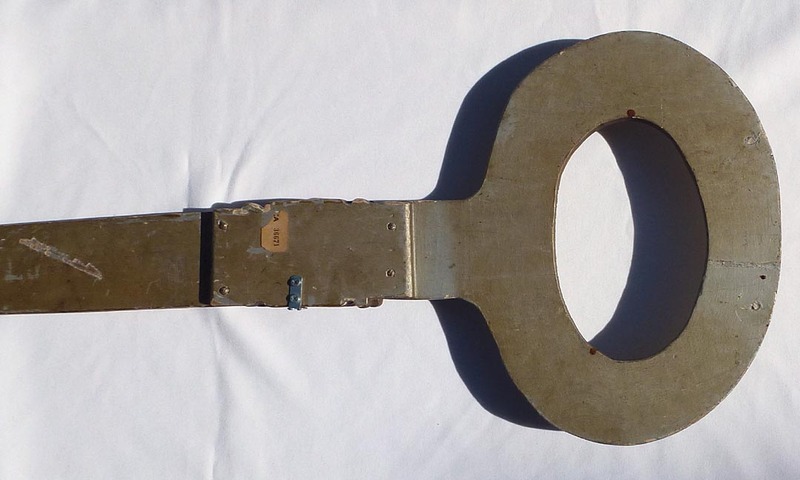 Some much larger photos: The largest key, with a yardstick ... Closeup ... Closeup, other end ... From above and below ... End view ... Back view ... Closeup of back ... Second closeup of back. 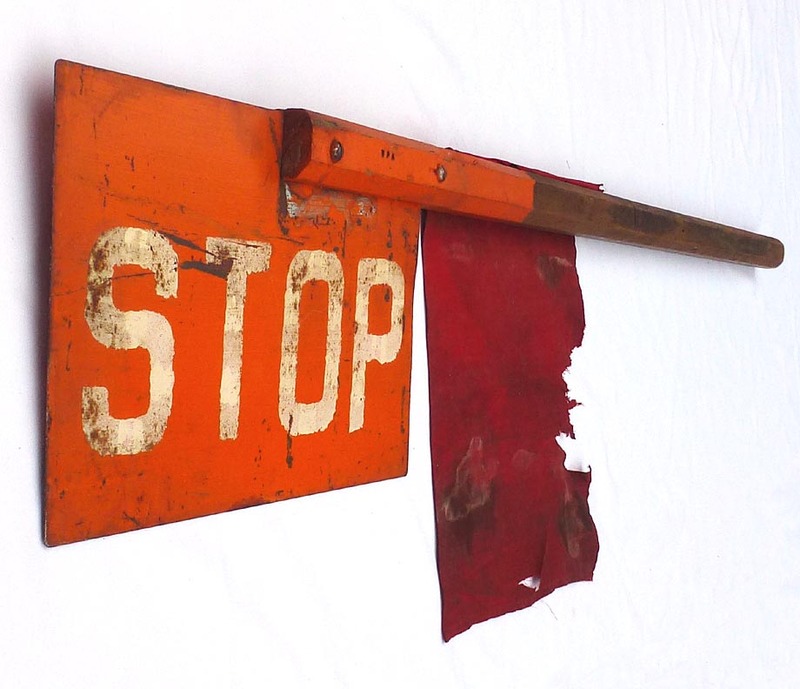 Two sided metal "Welcome" sign from the early 1900's is 31" long by 7" high excluding the metal chain hangers. It has finely crazed yellow and black paint. The condition is very good with some paint loss and oxidation from weathering. The price is $350.00. Inventory Code: CTST. 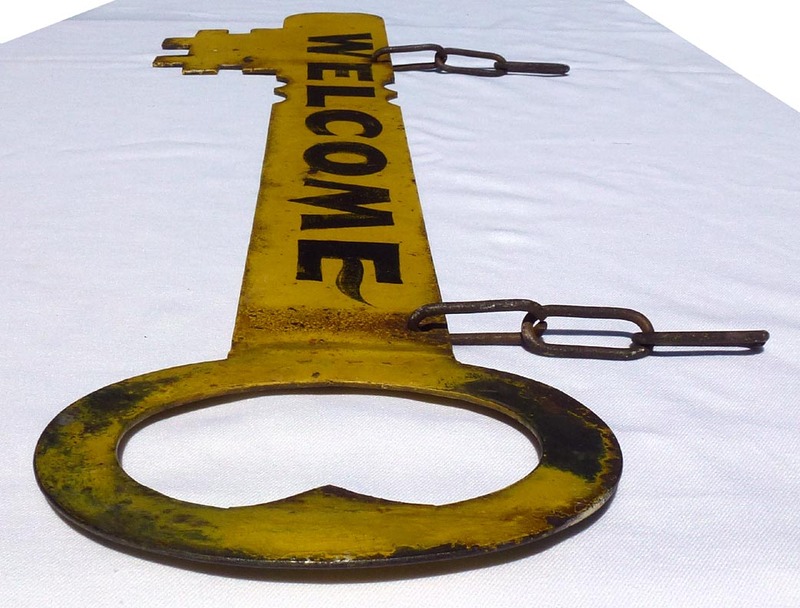 Two sided metal key "Welcome" sign, with a yardstick ... The other side ... End view. 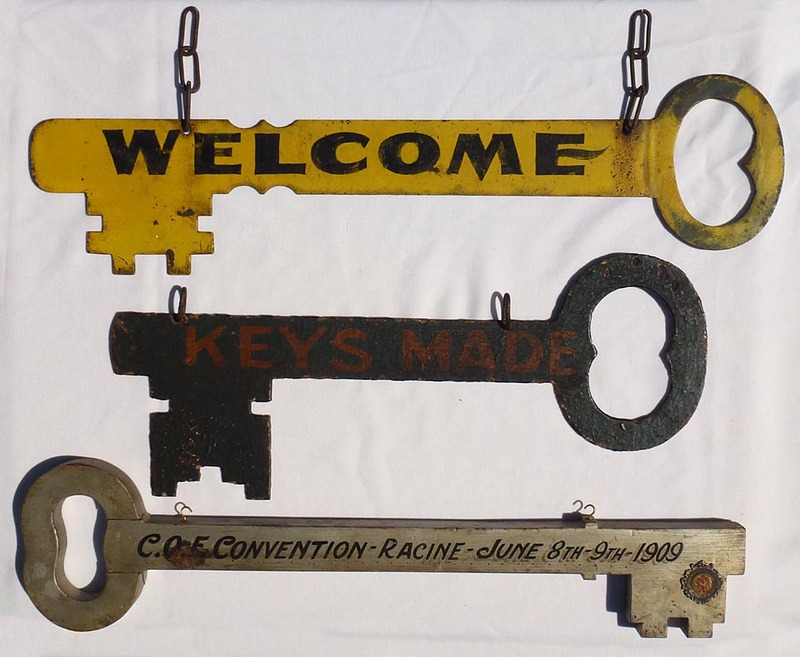 Some much larger photos: Two sided metal key "Welcome" sign, with a yardstick ... The other side ... End view. 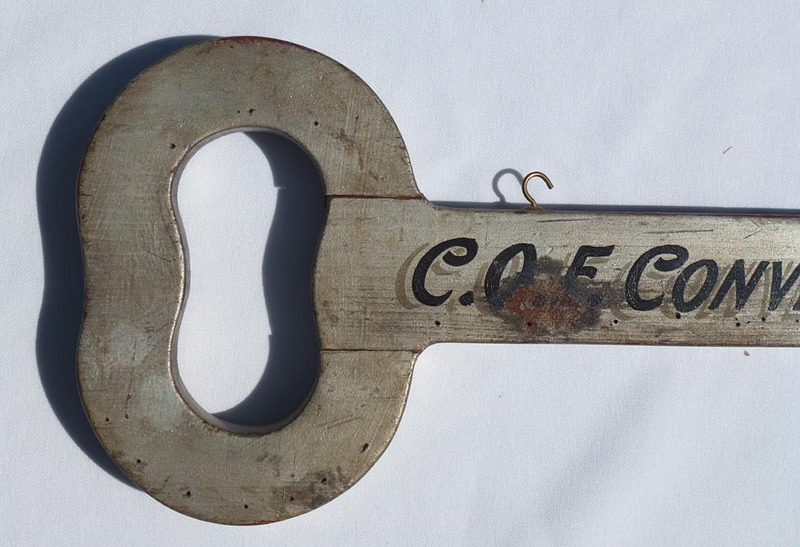 This is a long wooden key inscribed on one side "C.O.F. 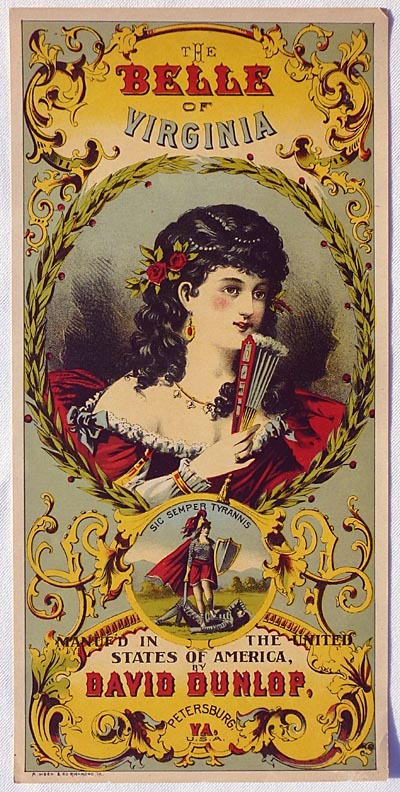 Convention Racine - June 8th-9th-1903", and on the other side "Presented by the Mayor", with some fancy painted flourishes. 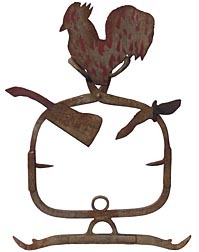 There is a metal emblem attached from the Catholic Order of Foresters which also has the date and city, as well as a leaping deer in front of a red cross. The key is 30" long by 7 1/4" high by 1" thick. It has some paint loss and a few small nicks as seen in the photos. 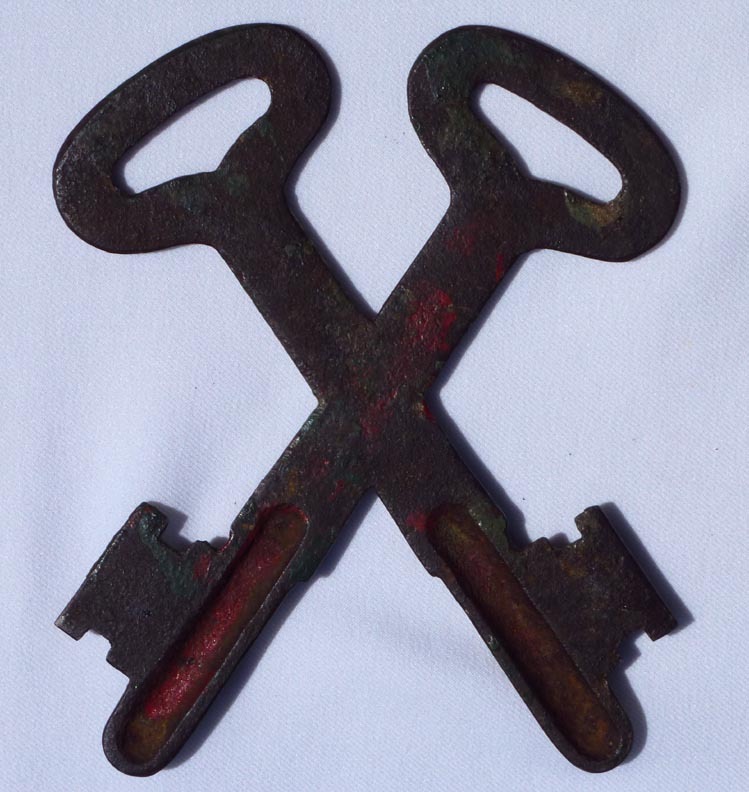 The head of the key has cracked through but is still intact. 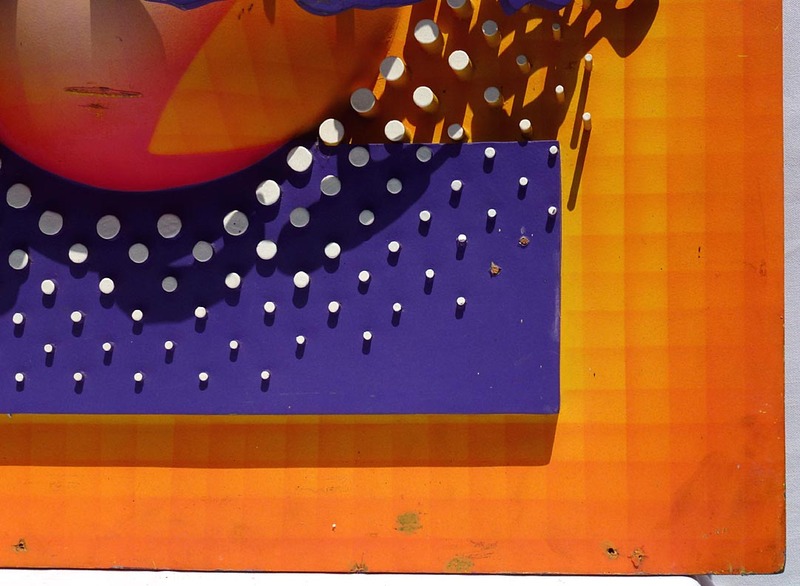 There is also a row of small pinholes along the bottom edge on the front, and a few on the back, as if something might have been tacked to the key? 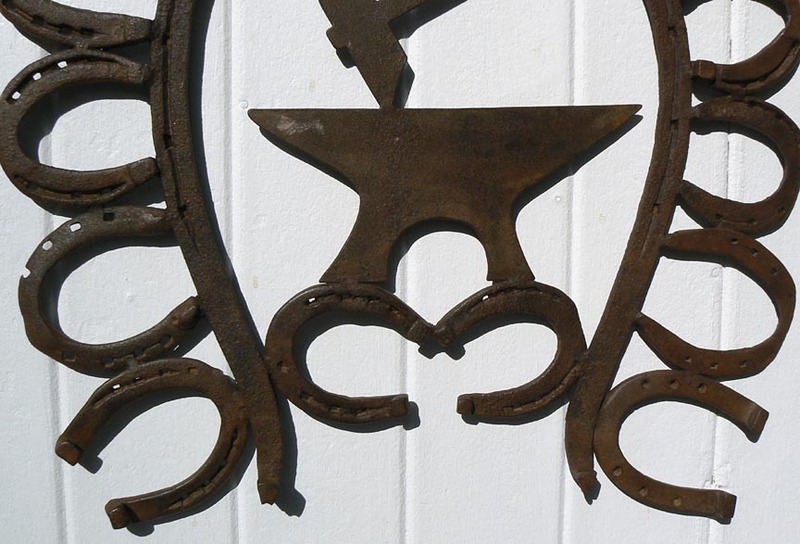 There are two cup hooks added to the top edge for hanging. The price is $350.00. Inventory Code: CTPA. 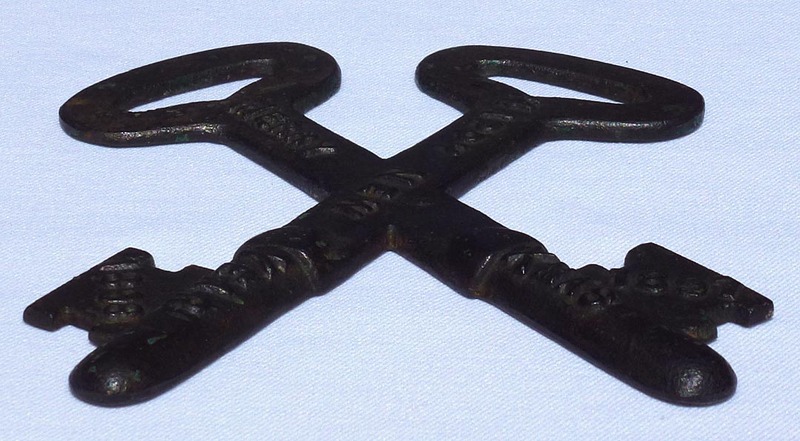 "Catholic Order of Foresters" key, with a yardstick ... The other side ... Closeup of the emblem ... Closeup, other end ... Closeup, reverse. 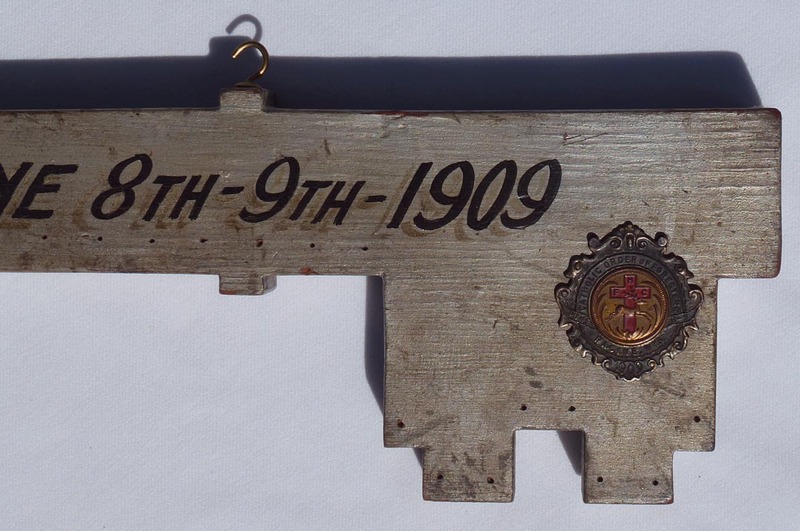 Some much larger photos: "Catholic Order of Foresters" key, with a yardstick ... The other side ... Closeup of the emblem ... Closeup, other end ... Closeup, reverse. 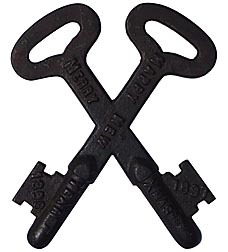 This is a cast iron depiction of crossed keys reading "Merry Xmas 1897, Happy New Year 1898". 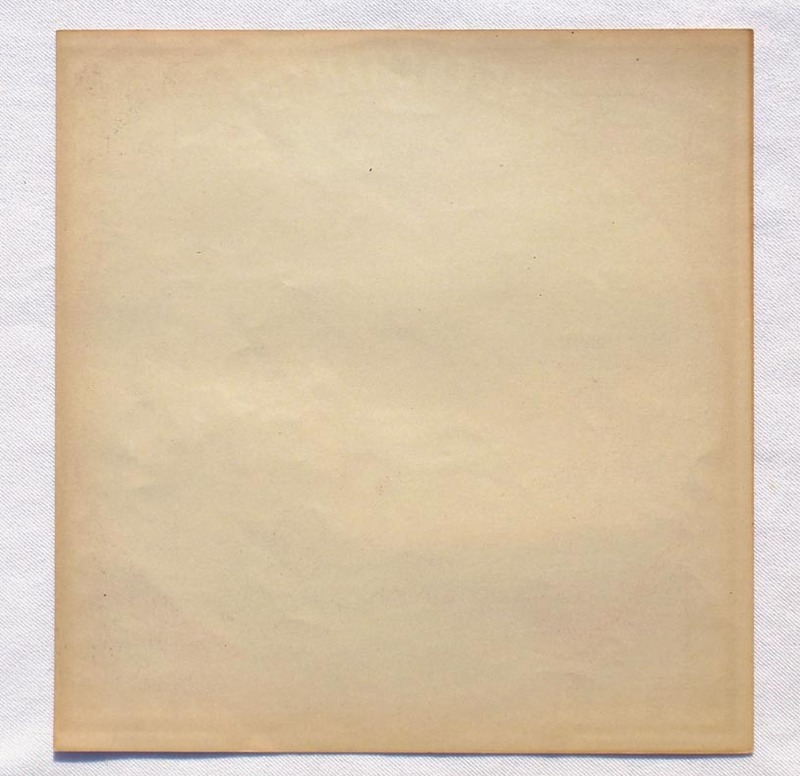 It is in excellent condition, with a very dark oxidized surface and faint traces of green and red paint. It measures about 7" by 6" by 1/4" thick. The price is $250.00. Inventory Code: CTSW. 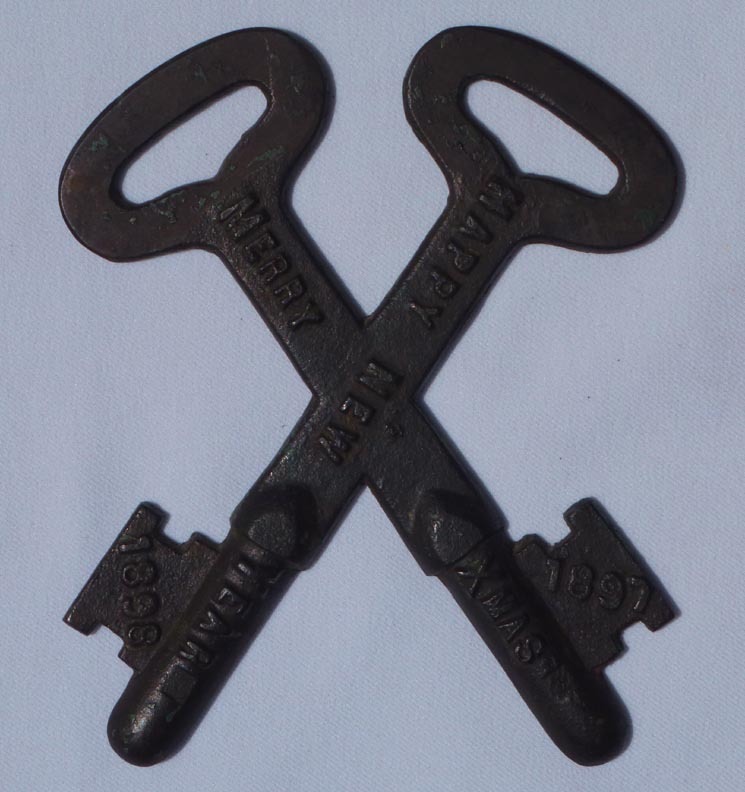 1897 Christmas souvenir metal keys ... From above ... From below ... Back view ... With a 12" ruler for scale. 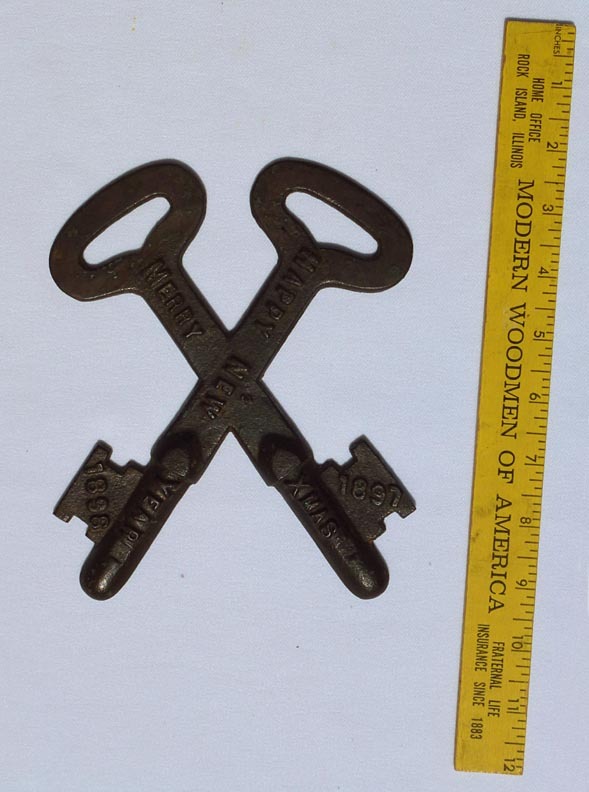 Some much larger photos: 1897 Christmas souvenir metal keys ... From above ... From below ... With a 12" ruler for scale. 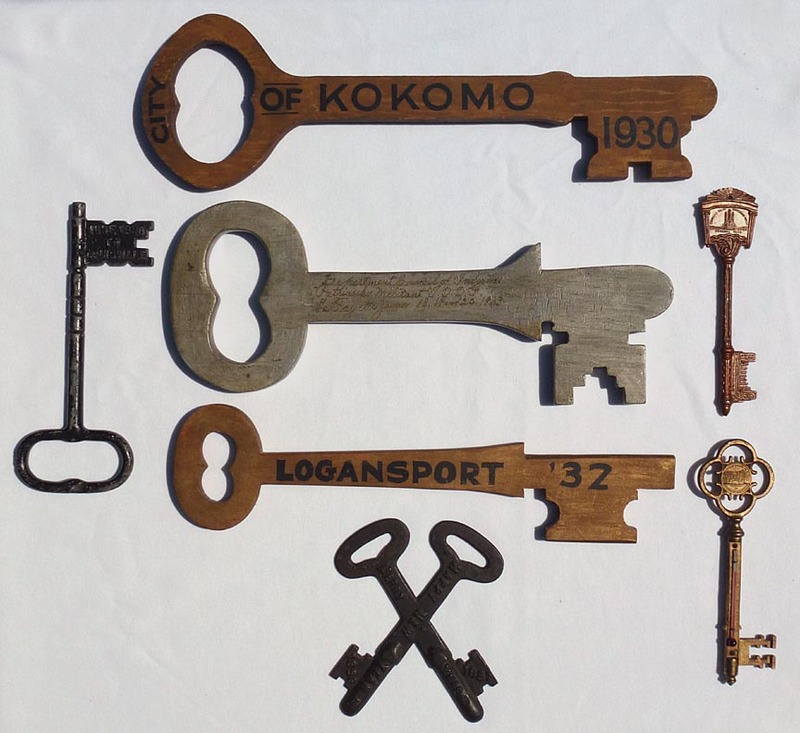 This wooden key has "City of Kokomo 1930" painted in black over dark gold. It is 19 1/2" long by 6" high by 3/4" thick. The condition is very good, with slight paint wear and a few nicks. There are several tack holes on the back. The price is $150.00. Inventory Code: CTPS. 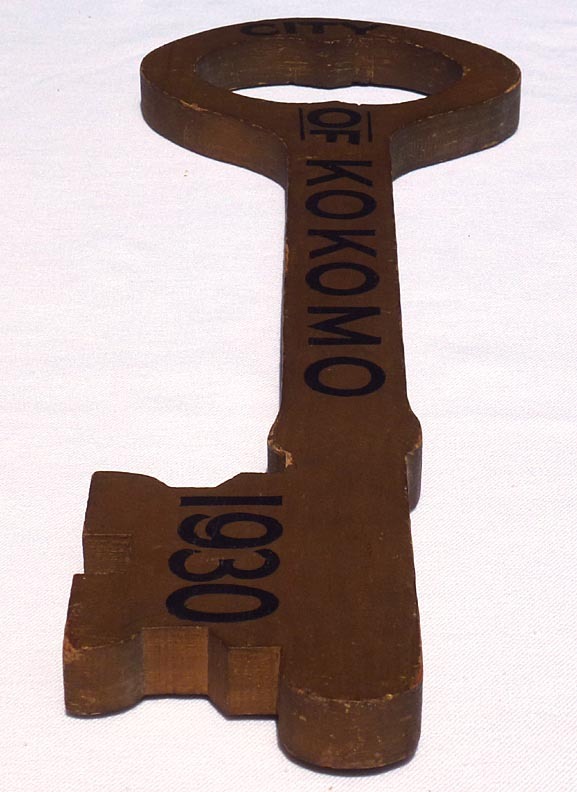 City of Kokomo ceremonial key, with a 12" ruler ... Back view ... End view ... The other end. 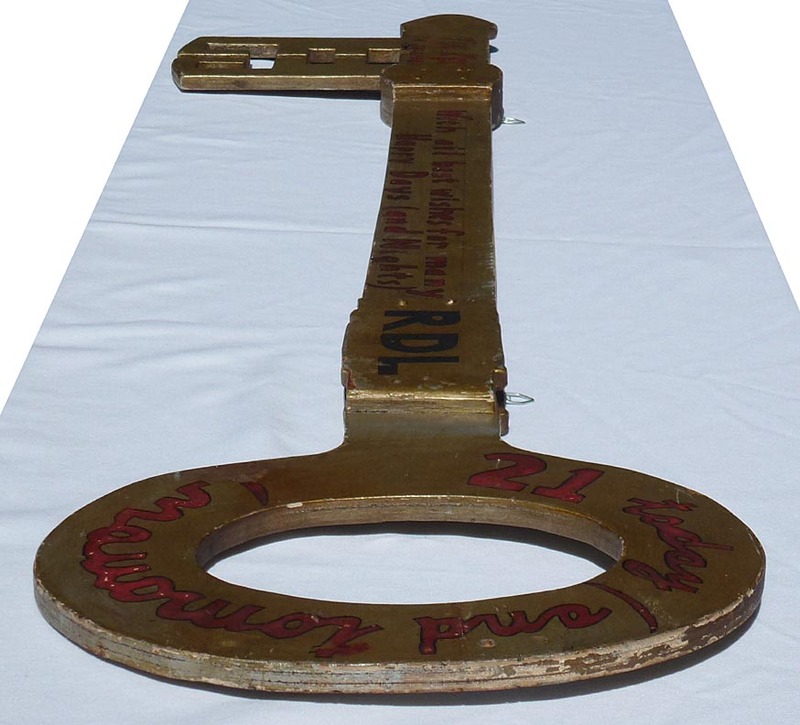 Some much larger photos: City of Kokomo ceremonial key, with a 12" ruler ... Back view ... End view. 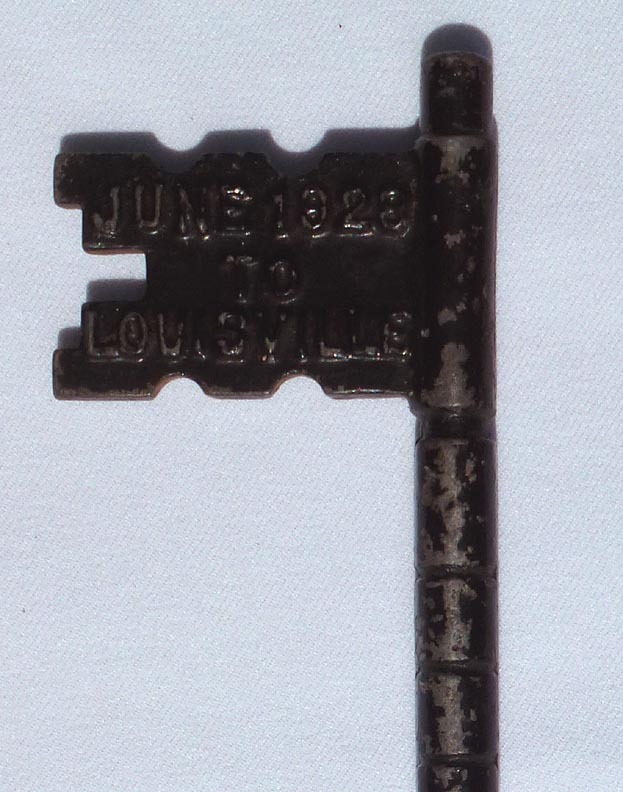 This metal ceremonial key is marked "June 1928 To Louisville". 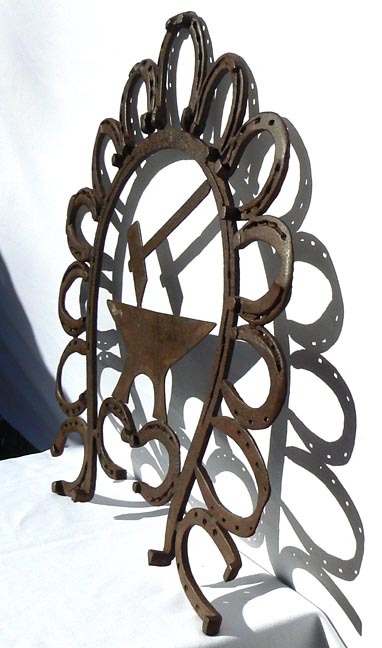 It is 10" long by 4 3/4" high by about 1/2" thick, with worn black paint. 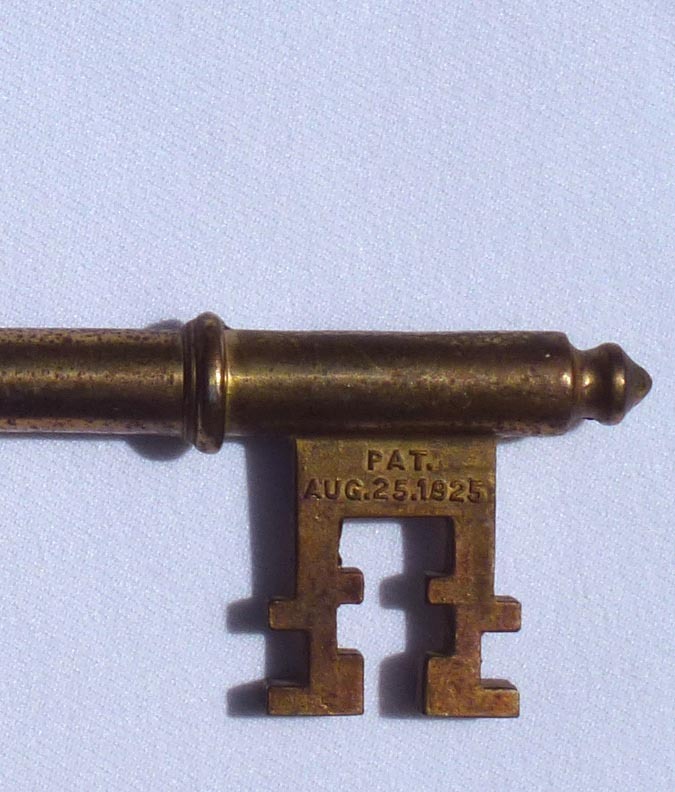 There is a chip or casting flaw on one side of the handle, done before the key was painted. The price is $150.00. Inventory Code: CTSH. 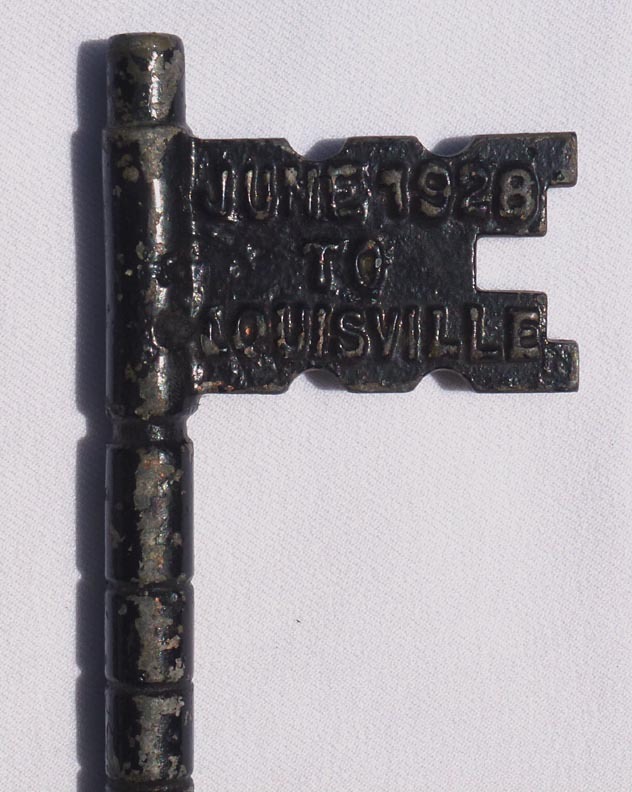 1928 Louisville key, with a 12" ruler ... Closeup ... The other side ... Closeup ... End view ... The other end. 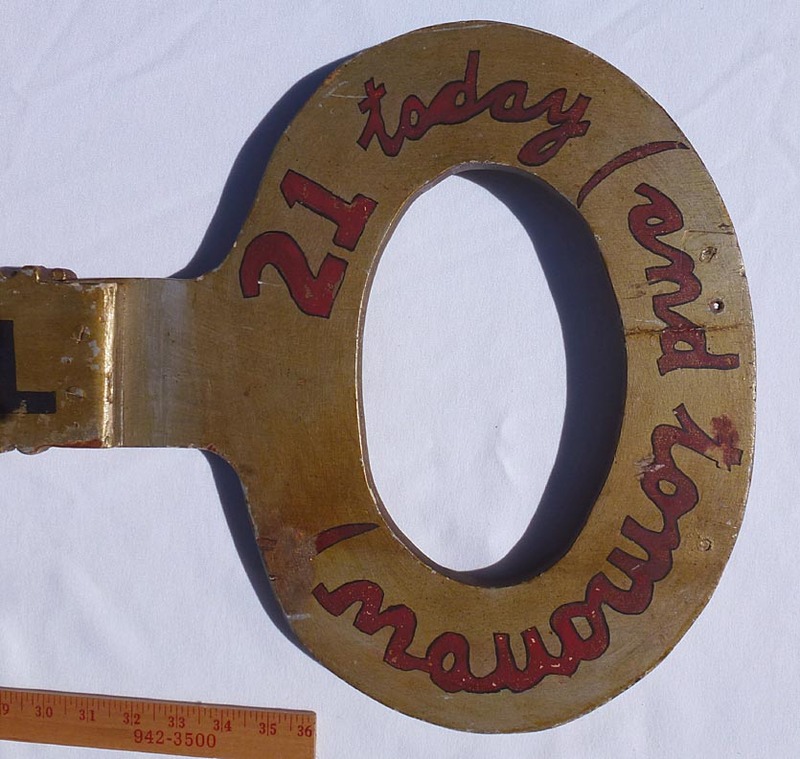 Some much larger photos: 1928 Louisville key, with a 12" ruler ... Closeup ... The other side ... Closeup ... End view. 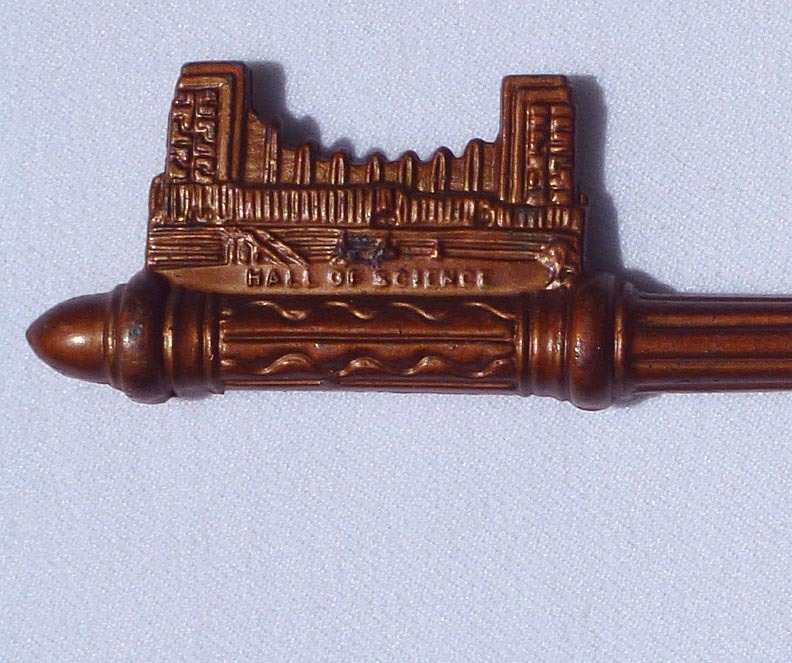 A heavy metal souvenir key from the 1934 Chicago World's Fair. It has details of the Travel & Transport Bldg., the Federal Bldg., and the Hall of Science. At one time there was a thermometer set into the shaft that is now gone. Otherwise, the condition is excellent, size is 7 3/4" long by 2" wide. The price is $65.00. Inventory Code: CTSO. 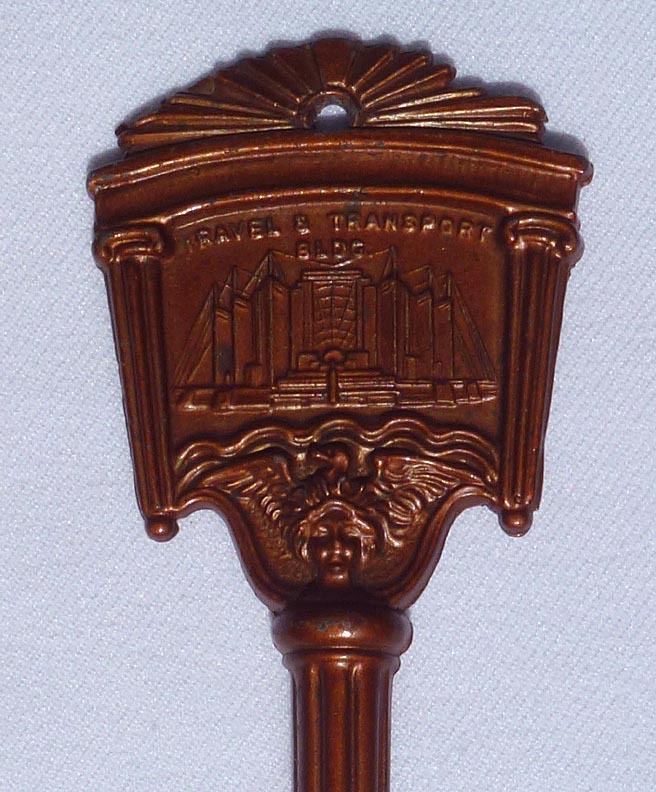 1934 World's Fair souvenir key ... Closeup of top ... Closeup of lower ... The other side ... Other side, closeup of top ... Closeup of lower ... 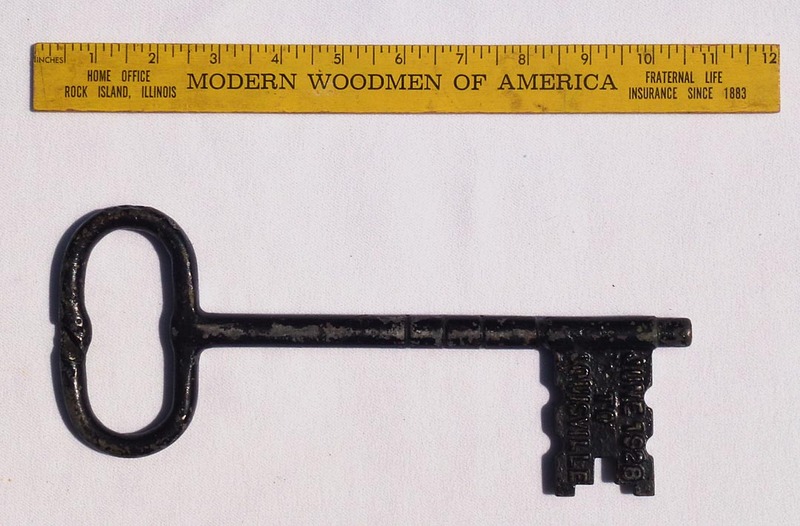 This key and the next one, with a 12" ruler for scale. 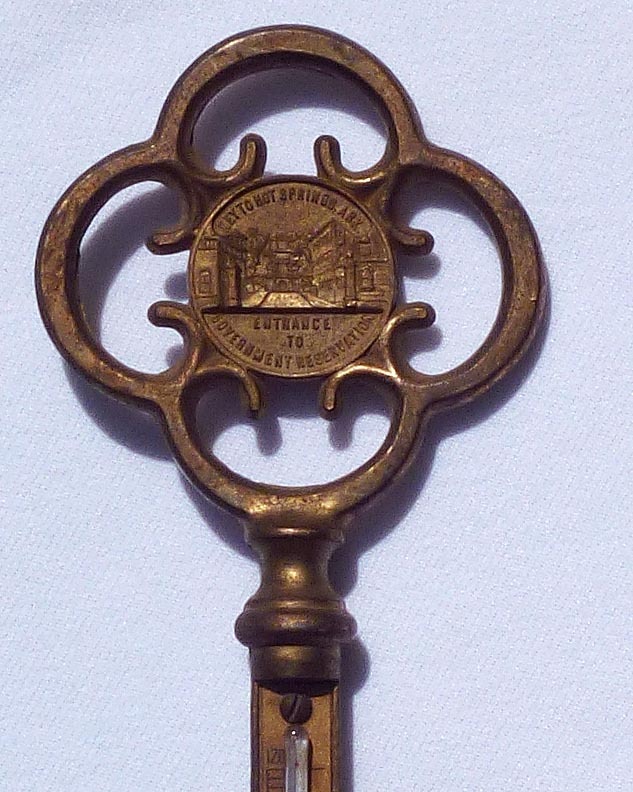 Some much larger photos: 1934 World's Fair souvenir key ... Closeup of top ... Closeup of lower ... The other side ... Other side, closeup of top ... Closeup of lower ... This key and the next one, with a 12" ruler for scale. 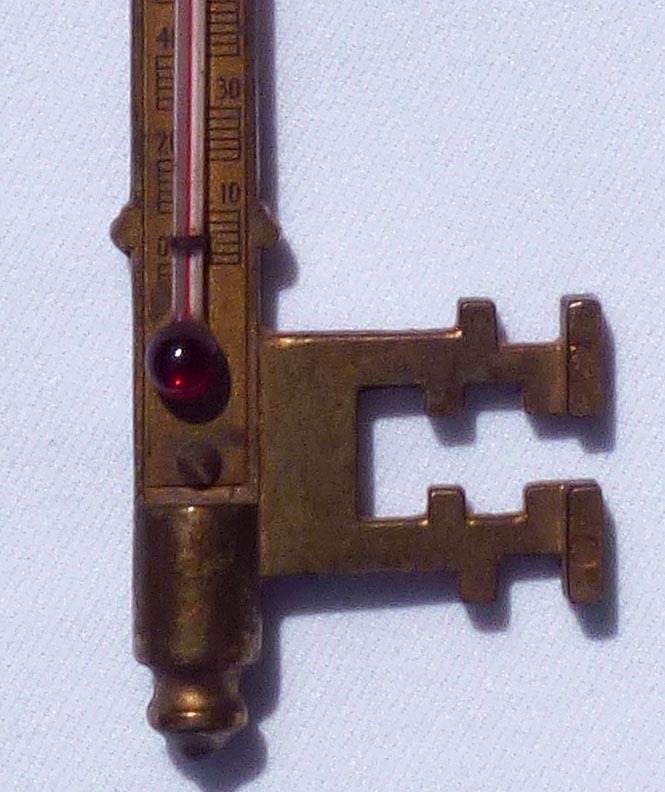 A souvenir thermometer in the form of a key. The front is inscribed "Hot Springs, Ark. Entrance to Government Reservation". 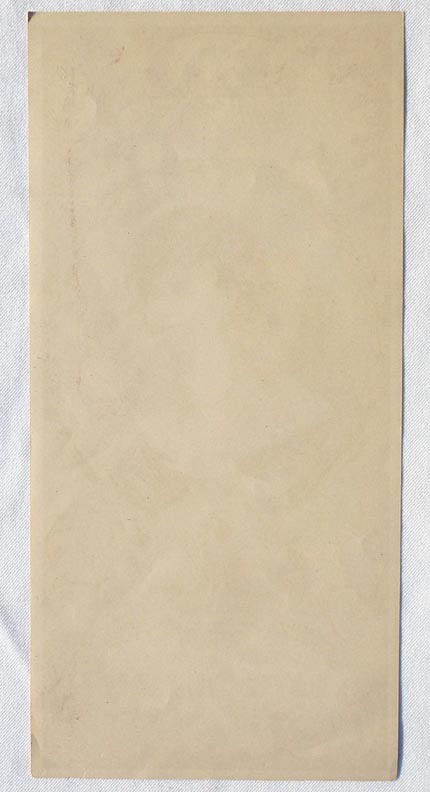 The back has a patent date of Aug. 25, 1925 and a U.S. seal with an eagle. 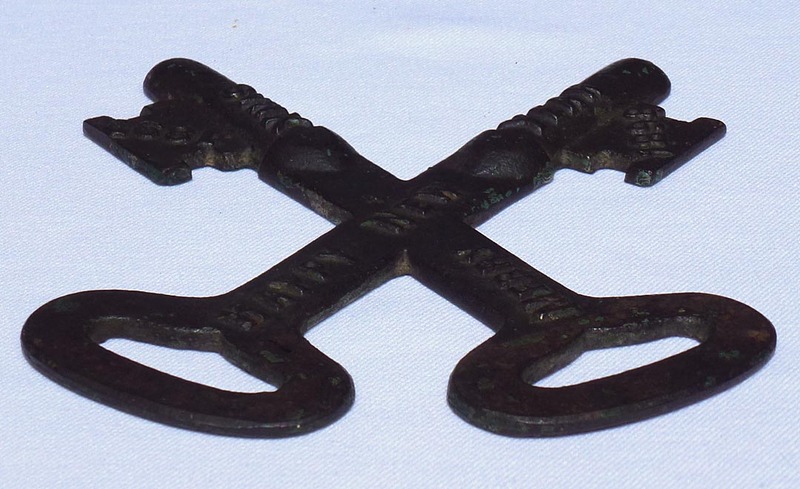 It is 8 1/2" long by 2 3/4" wide, in very good condition with a slightly oxidized surface. The price is $110.00. Inventory Code: CTSR. Hot Springs souvenir thermometer key ... Closeup of top ... Closeup, lower ... Other side ... Other side, closeup of top ... Closeup of lower ... 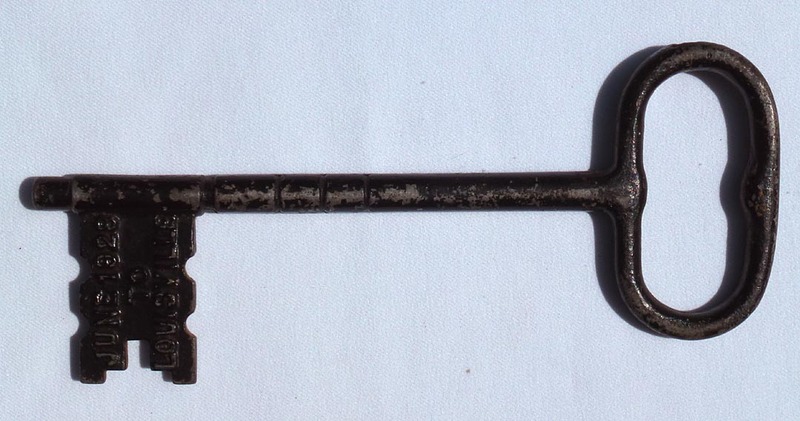 This key and the one above, with a 12" ruler for scale. 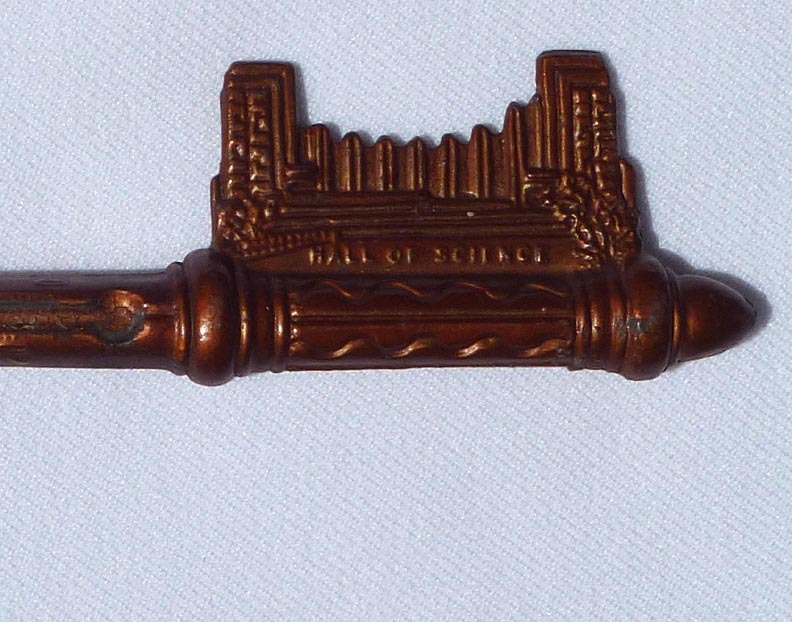 Some much larger photos: Hot Springs souvenir thermometer key ... Closeup of top ... Other side ... Other side, closeup of top ... Closeup of lower ... 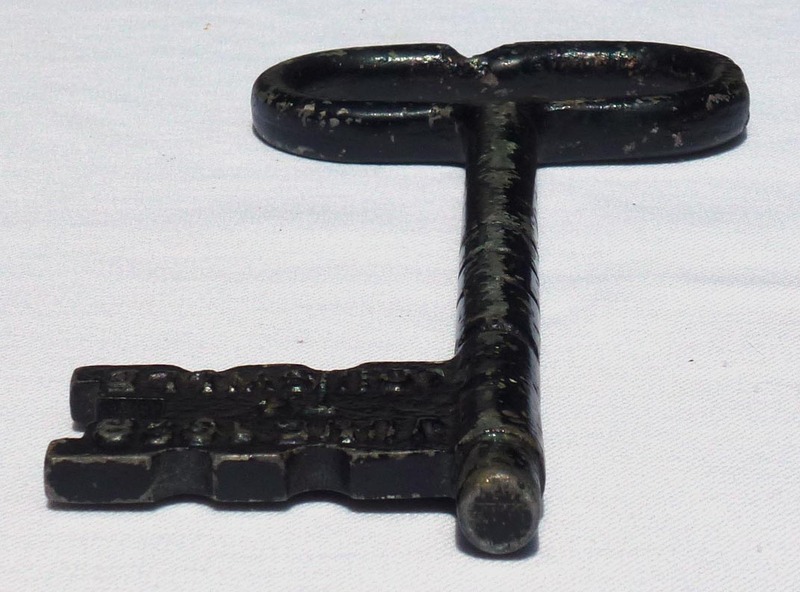 This key and the one above, with a 12" ruler for scale. This is an old iron trade sign for a blacksmith shop. 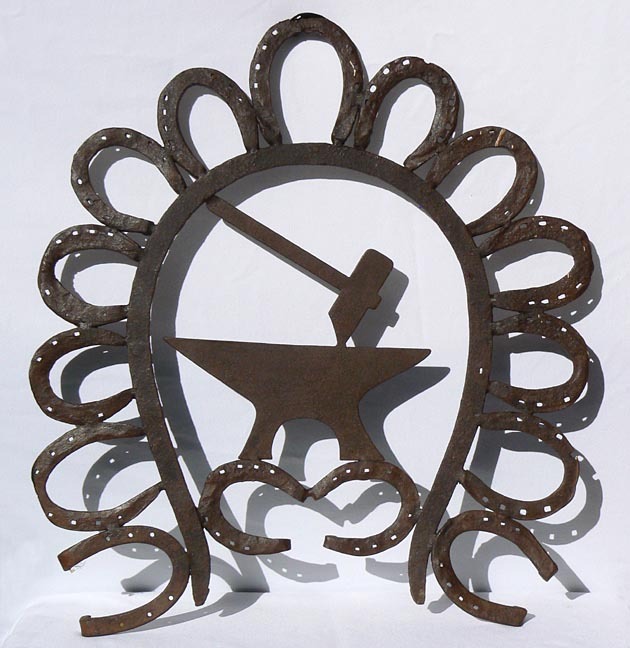 It was made and forged, using a variety of horse shoes, welded around a much larger stylized horse shoe. 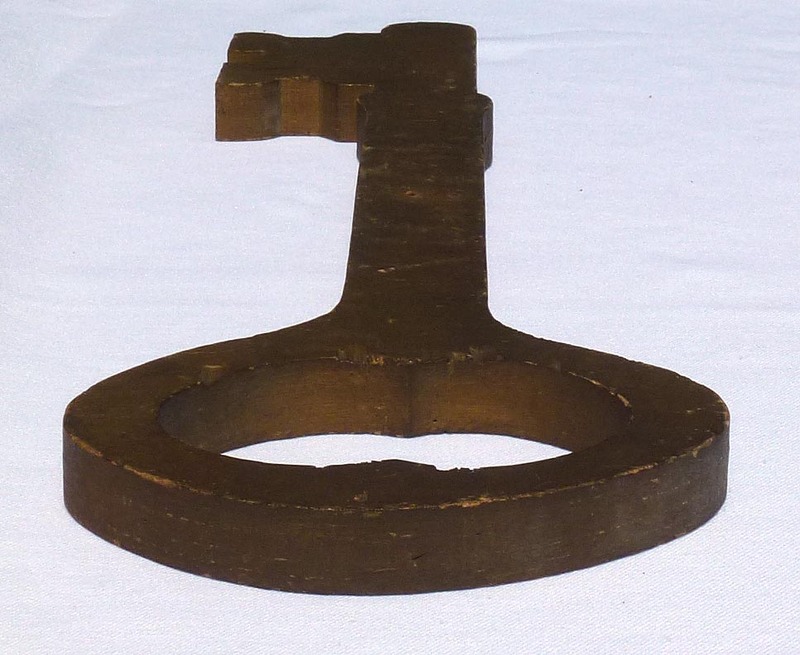 This encloses a cut and hammered anvil and blacksmith's hammer. The piece is about 28 1/2" high by 25 1/2" wide. It is in excellent condition, and has developed an old dark rich surface, which is highly desirable and reflects many years of outdoor use. There are a few small old paint drips, mostly on the back. 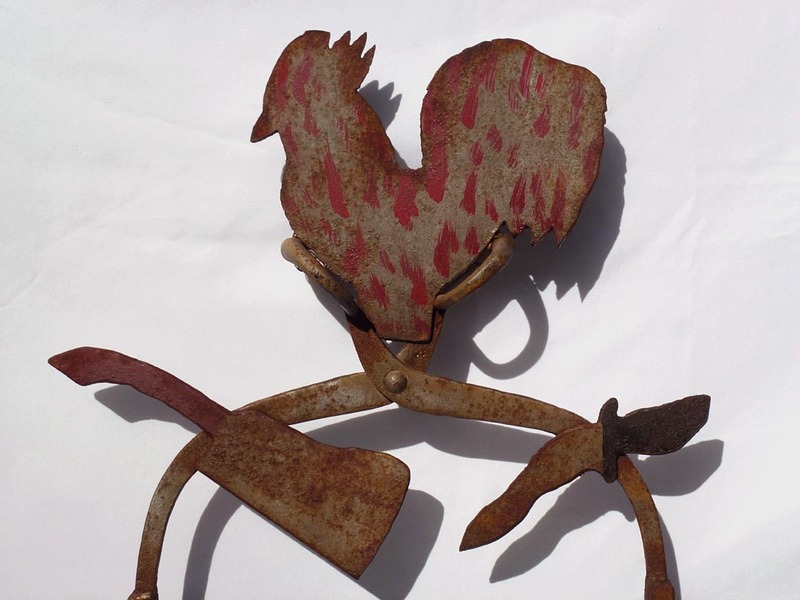 It was probably made in the mid to late 1800's. The price is $2500.00. Inventory Code: TROC. 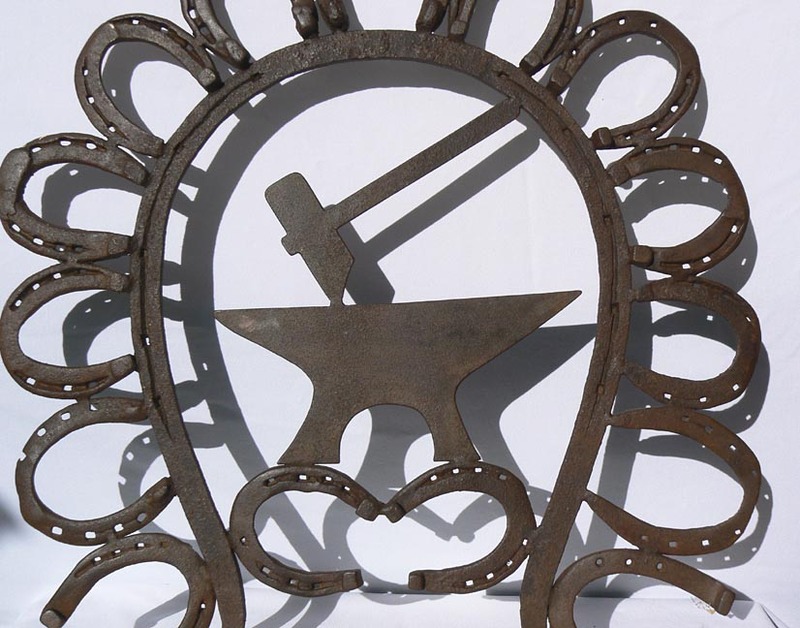 See a slideshow of several views [482k] ... 19th c. blacksmith's trade sign ... Closeup of top ... Closeup of anvil and hammer ... Closeup of bottom ... Closer view of top ... Side view ... The other side ... Back view ... Closeup of the back. 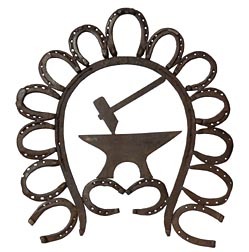 Some much larger photos: 19th c. blacksmith's trade sign ... Closeup of top ... Closeup of anvil and hammer ... Closeup of bottom ... Side view ... The other side ... Back view ... Closeup of the back. 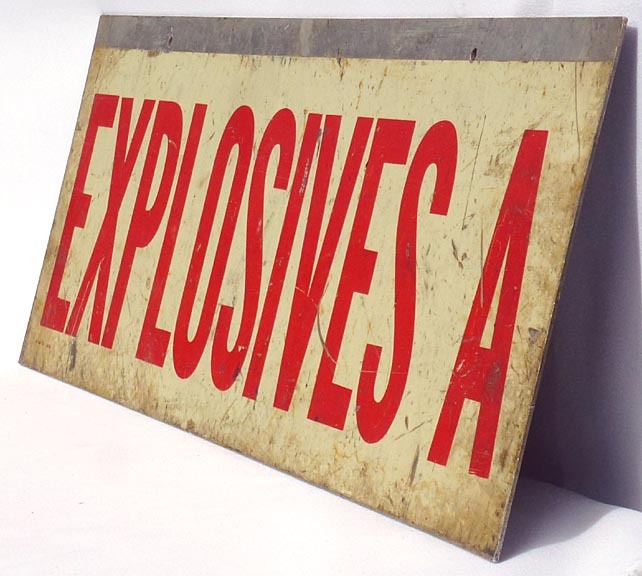 This is an industrial metal "Explosives A" sign. 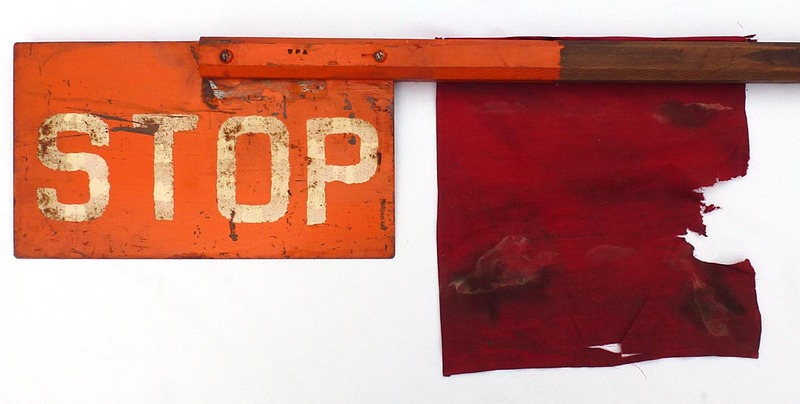 The back is inscribed "Harlan, KY coal mine". It has a worn surface, with a printed date of "1 Jan 67" in the lower left. The paint is very reflective when the light strikes it at the right angle. 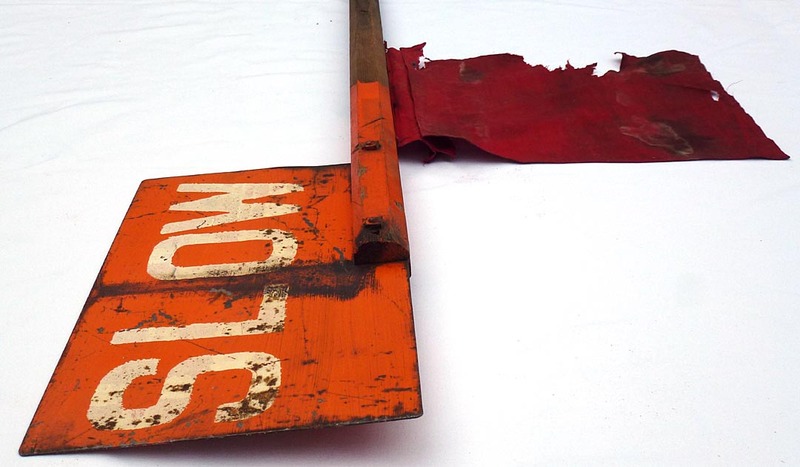 It measures 8 7/8" high by 30" wide, in great looking, worn, used condition with some paint loss as seen in the photos. The price is $350.00. Inventory Code: CHPC. Explosives sign ... Closeup, left ... Closeup, right ... Side view ... The other side ... Back view ... Tilted to reflect light ... With a soda can for scale. 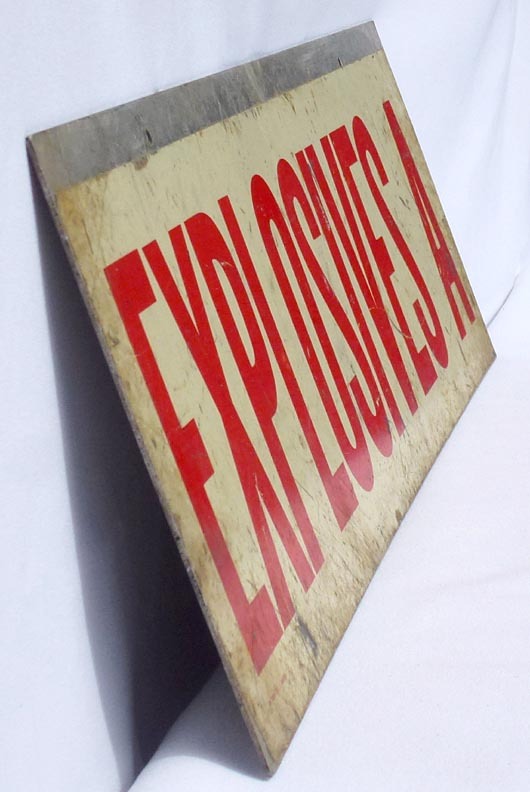 Some much larger photos: Explosives sign ... Closeup, left ... Closeup, right ... Side view ... The other side ... Back view ... Tilted to reflect light ... With a soda can for scale. 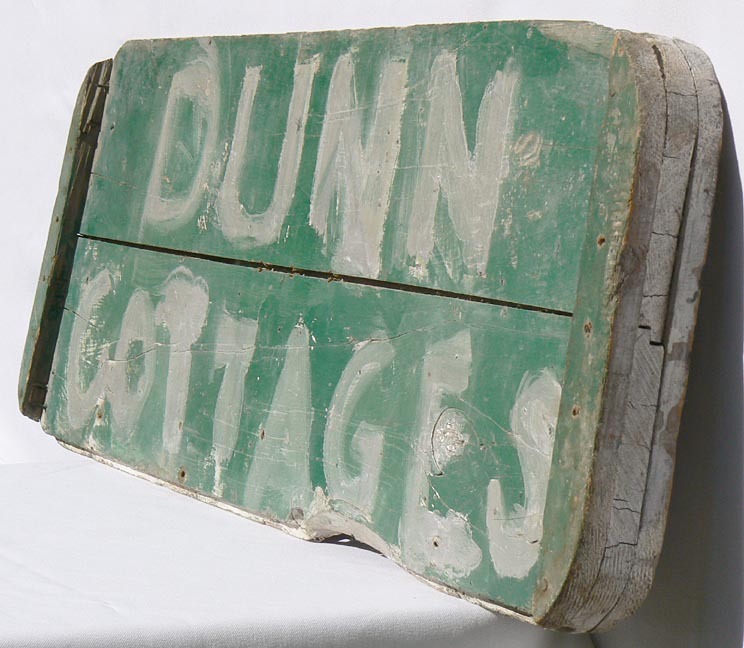 This is a two-sided, folky painted wood sign for "Dunn Cottages". One side is white, with stenciled black lettering. The other side is green, with wild, primitive, freehand lettering done in silver paint with a wide brush. Two completely different effects in one sign. 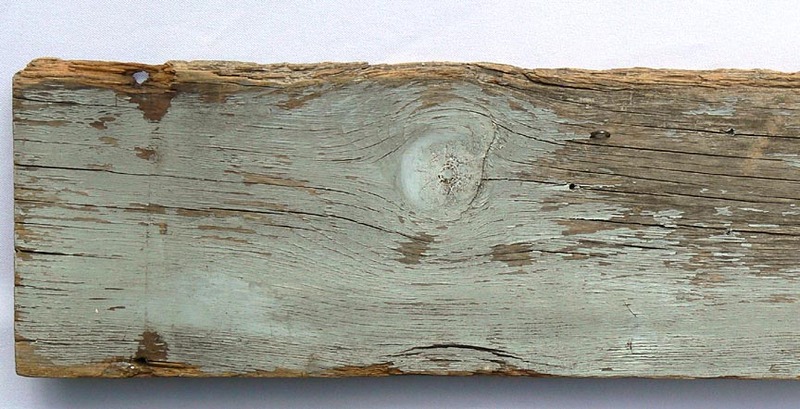 The paint is strong, and nicely weathered from years of outdoor use. 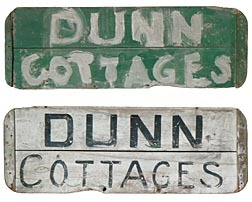 The sign is painted on pine boards, with applied borders on the two ends. It measures 40 1/4" wide, 14 1/4" high, and 2 1/4" thick. 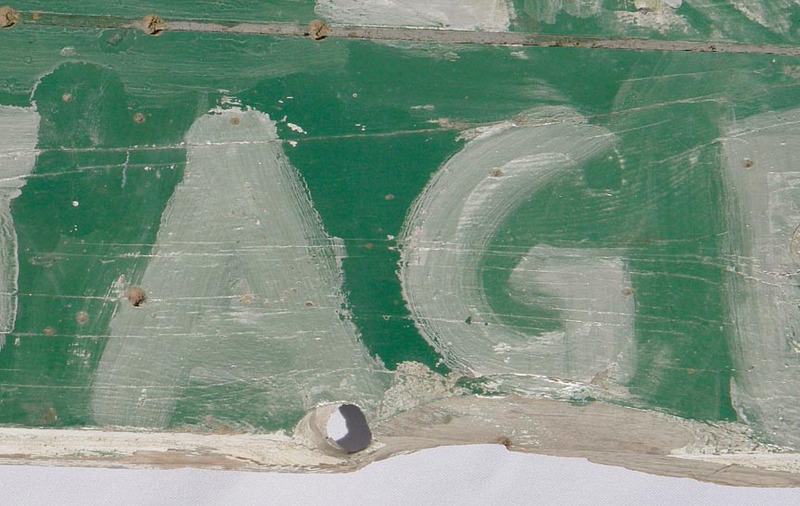 There is some old loss around the edges, and a couple of drips of green paint on the white side. The age is 1930's or '40's. The price is $195.00. Inventory Code: TPKW. 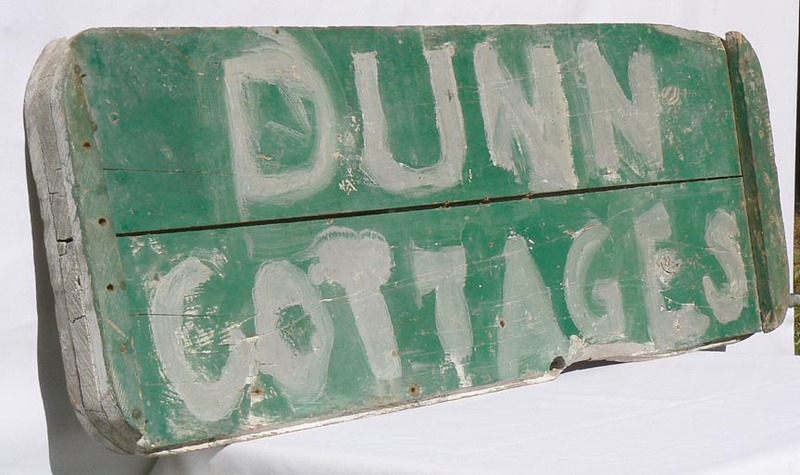 Green side: Painted cottage sign ... From a side angle ... From the other angle ... Closeup ... From below. White side: Overall view ... Side view ... From the other angle ... From above. 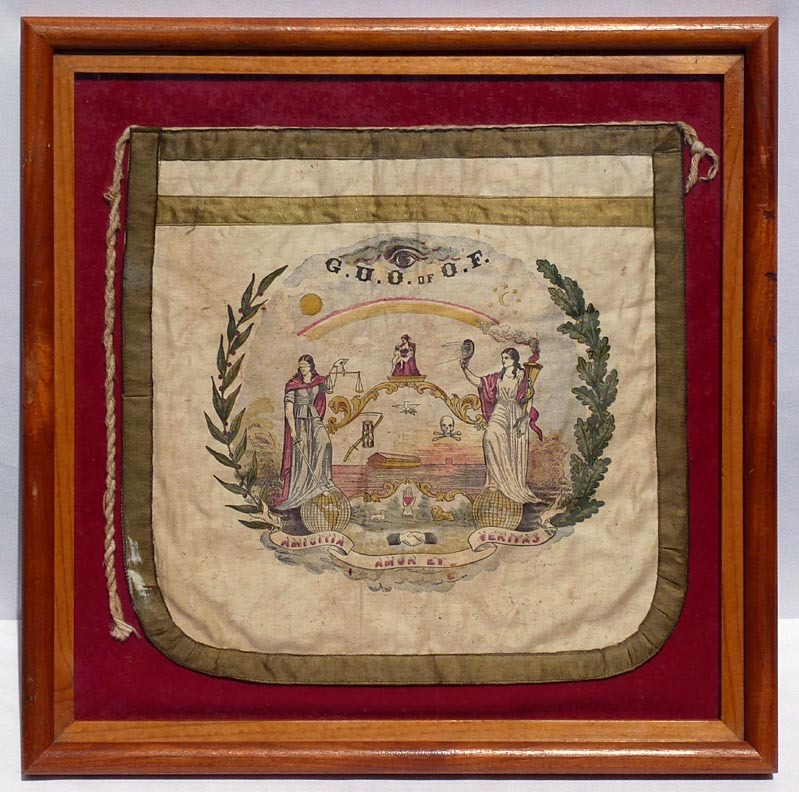 This is a beautiful and rare ceremonial costume panel from the Grand United Order of Odd Fellows, an early African-American fraternal group. 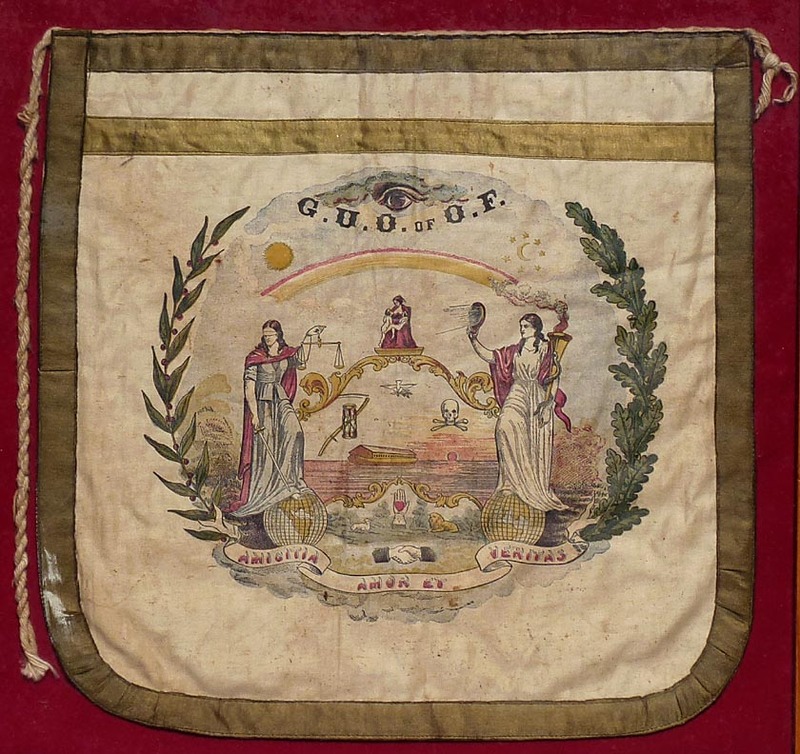 Called an apron, it was worn by some of the men of the lodge. 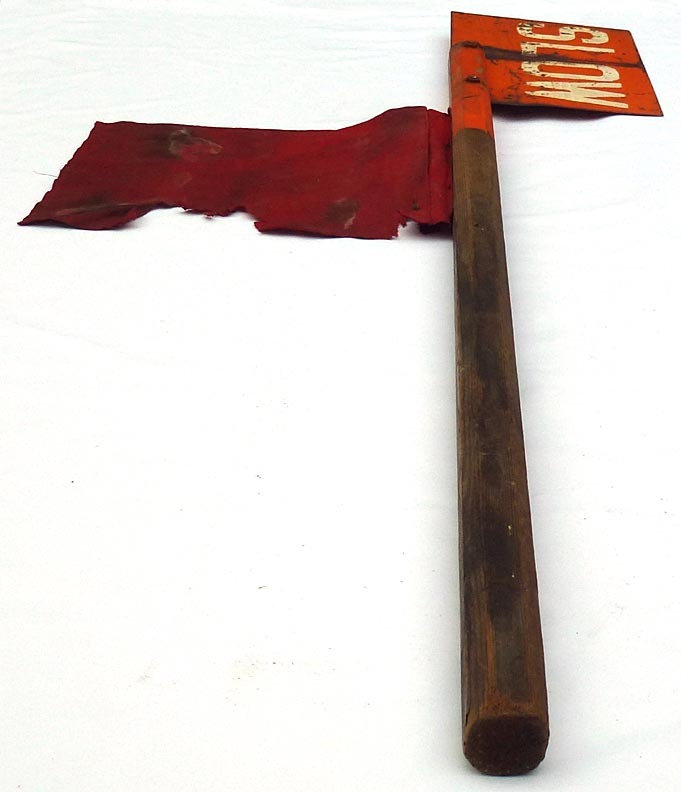 It dates from the middle to late 1800s, and has been mounted on red fabric, in an oak frame under glass. 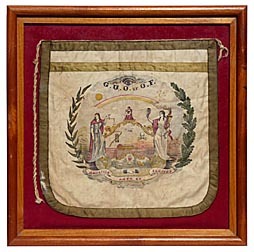 The image was printed on silk, with satin ribbon borders and part of the cotton cord waistband. Some of the many symbols include the All-Seeing Eye, sun, moon, and stars, Noah's Ark, dove of peace, skull and cross bones, heart in hand, and much more. 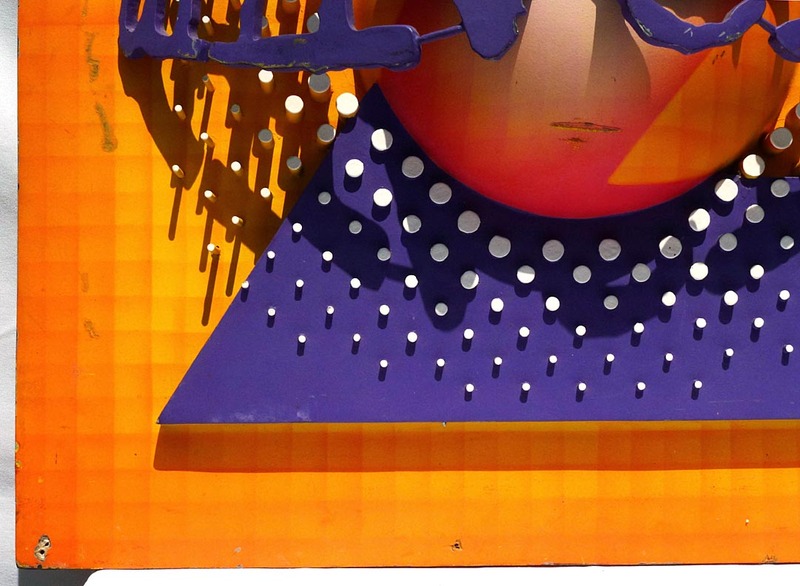 The piece itself measures 15" by 15", the frame is 20 1/2" by 20 1/2". It is in very good condition with minor foxing and staining, slight separation of one corner of the border, and what looks like a bit of paint on the lower left of the border. 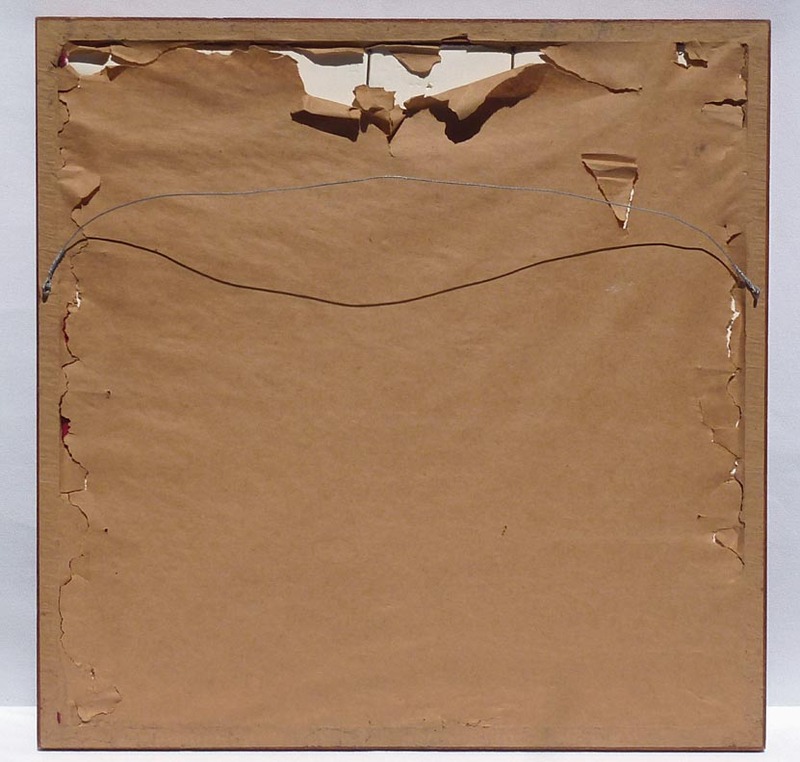 There is also some slight wear and scuffing to the frame, and damage to the paper backing of the frame. There is some interesting history of the G. U. O. of O. F. here and here. Yale University Library has a video here that shows a lodge parade, with many of the men wearing similar aprons (about 4:10 into the video). The price is $975.00. Inventory Code: CCRP. 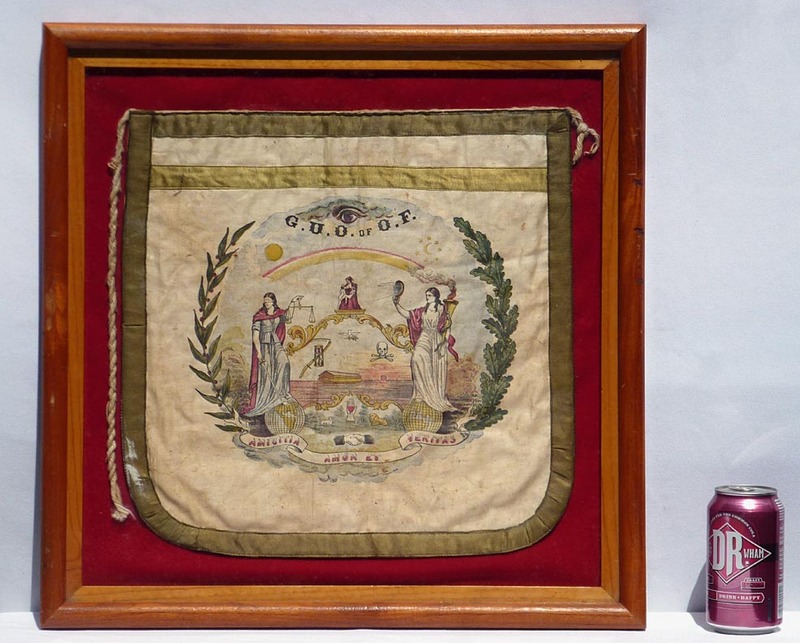 Odd Fellows ceremonial apron ... Closeup ... Side views ... Back of frame ... With a soda can for scale. 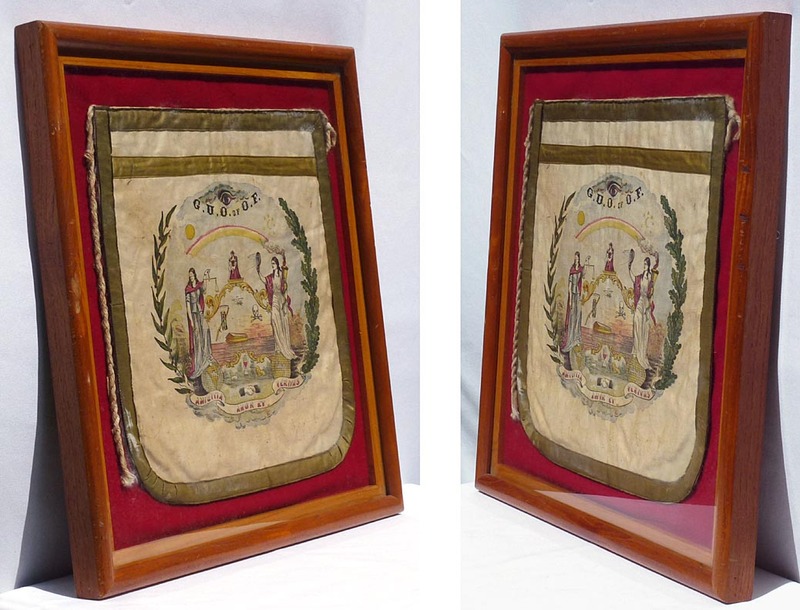 Some much larger photos: Odd Fellows ceremonial apron ... Closeup ... Side views ... Back of frame ... With a soda can for scale. Here are three beautiful lithographed tobacco crate labels from the late 1800's. These are original, unused old stock paper labels that were never glued to a crate. They have great color and designs. 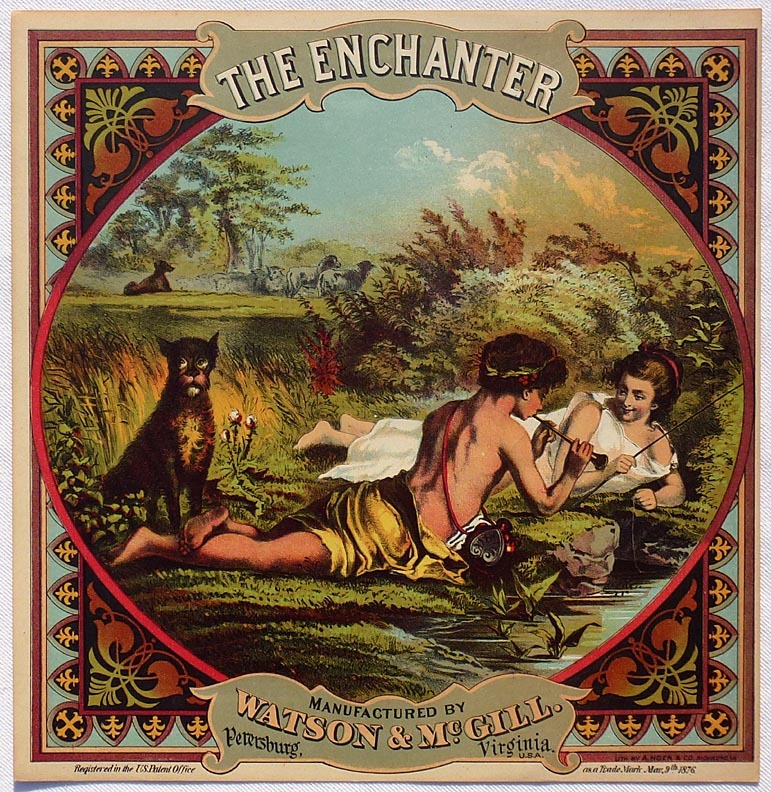 "The Enchanter" "Manufactured by Watson & McGill, Petersburg, Virginia, USA" is 10" wide by 10 1/4" high, in near mint condition. The price is $95.00. Inventory Code: CTOA. "The Enchanter" tobacco crate label ... Back ... With a 12" ruler for scale. 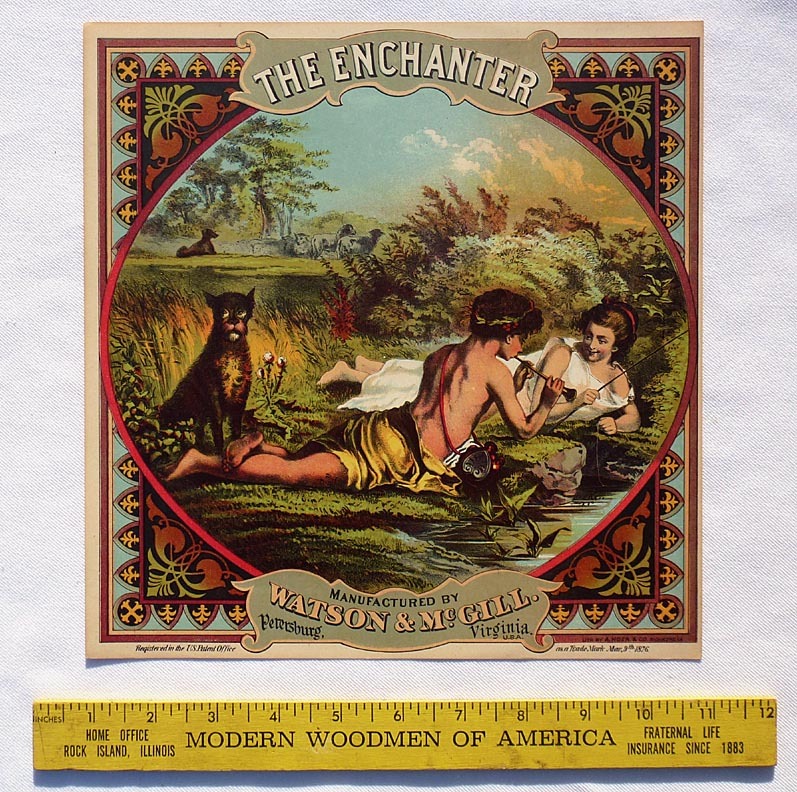 Some much larger photos: "The Enchanter" tobacco crate label ... Back ... With a 12" ruler for scale. "Diana" is 10 7/8" high by 6 3/4" wide, with very rich color. 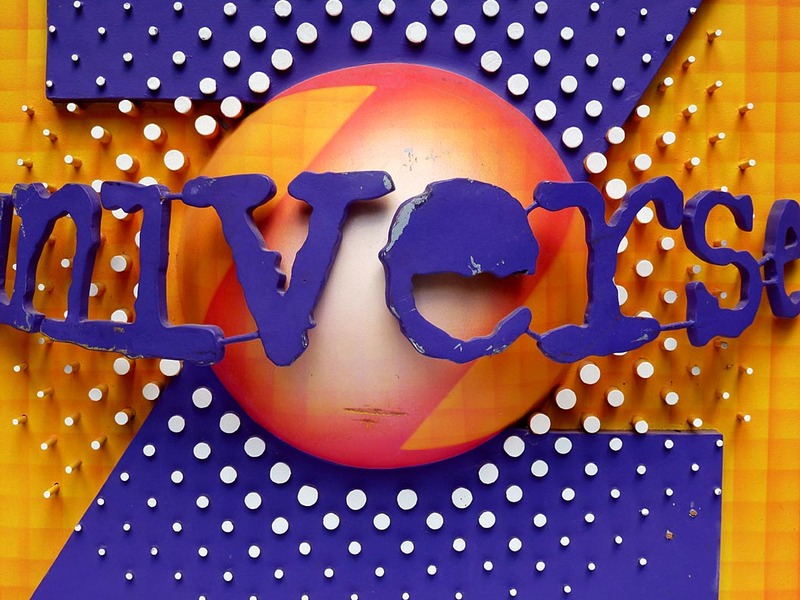 There is a small split in the paper under the letter "I" in Diana, as seen in the closeup. The price is $95.00. Inventory Code: CTOH. 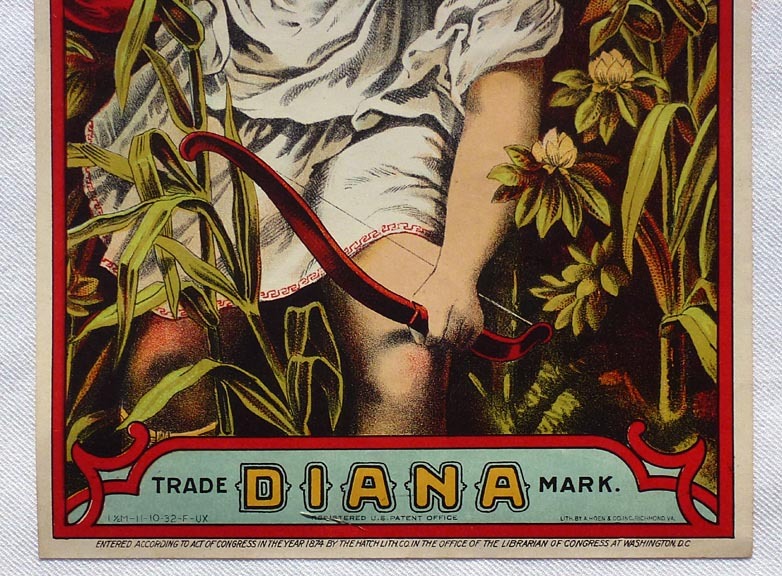 "Diana" tobacco crate label ... Closeup ... Back ... With a 12" ruler for scale. 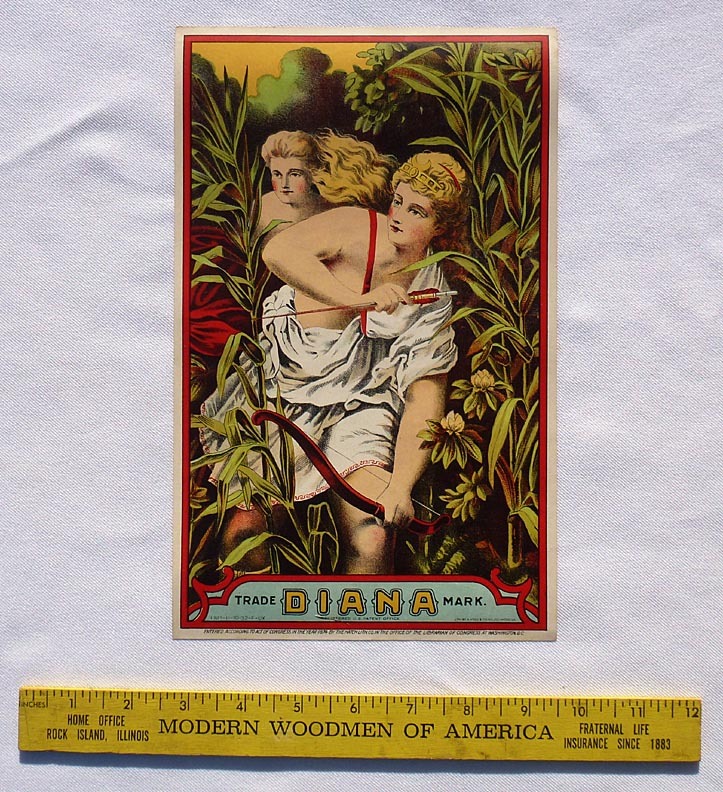 Some much larger photos: "Diana" tobacco crate label ... Closeup ... Back ... With a 12" ruler for scale. 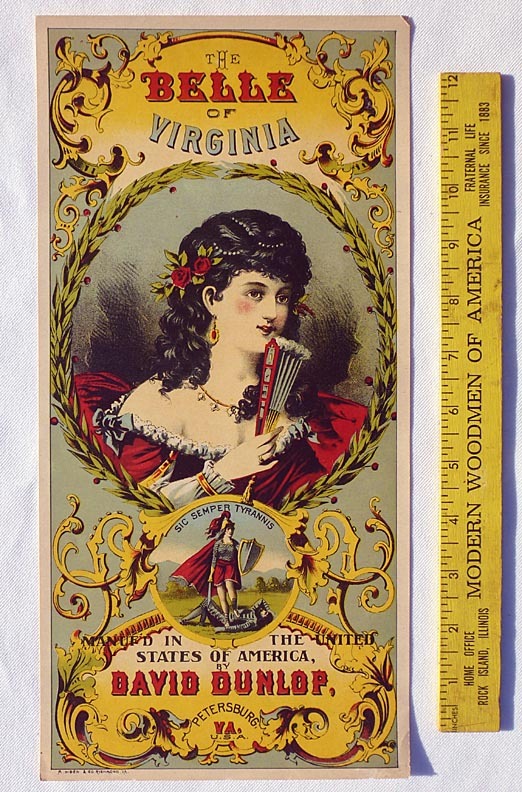 "The Belle of Virginia" is 13 7/8" high by 6 3/4" wide. There is a corner crease in the border only in the upper right, and a little roughness of the bottom edge, again only in the border. The price is $95.00. Inventory Code: CTOW. "Belle of Virginia" tobacco crate label ... Back ... With a 12" ruler for scale. Some much larger photos: "Belle of Virginia" tobacco crate label ... Back ... With a 12" ruler for scale. 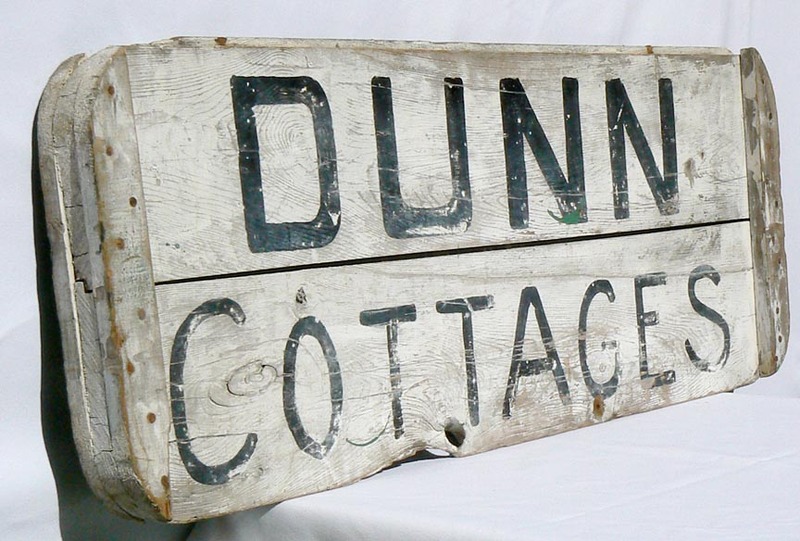 This is a folky old wood sign. 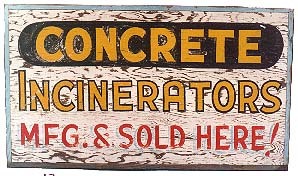 Painted on a single board is the message: "$100.00 reward for information leading to the arrest & conviction of any person destroying or damaging this company's property..." The sign looks like it was done about the 1940's and the paint, with some slight wear is still good and strong. 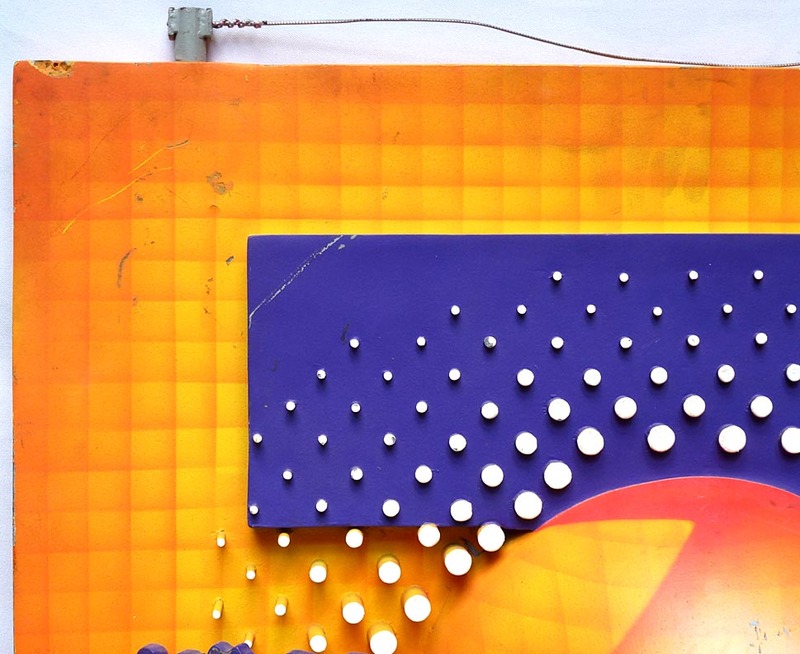 Two metal loops were added on the back for hanging. 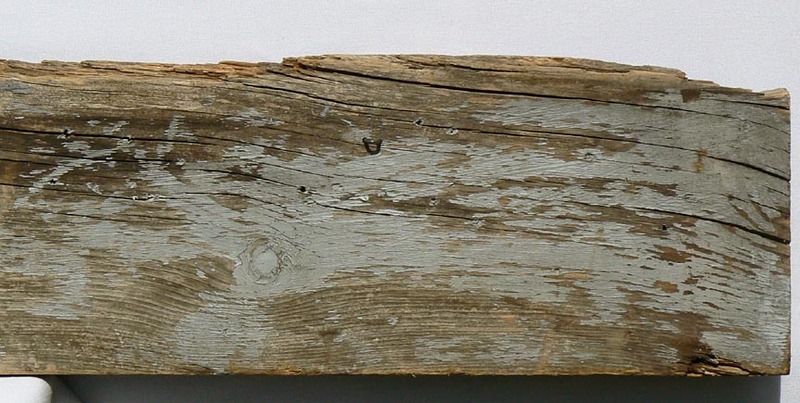 The board has some old dry rot along one edge. 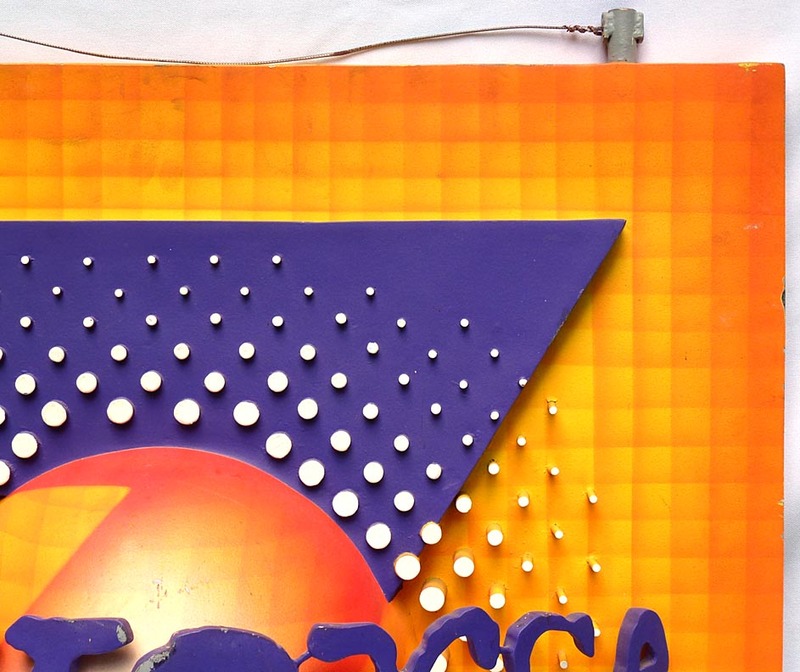 This sign is 65" long by 7 1/4" high by 3/4" thick. The price is $175.00. Inventory Code: TORK. Reward sign ... Closeup, left side ... Closeup middle ... Closeup, right side ... Closeup from above ... Another closeup from above ... Overall, side view ... Back view ... Closeup, back left ... Closeup, back middle ... Closeup, back right ... With a yardstick and soda can for scale. 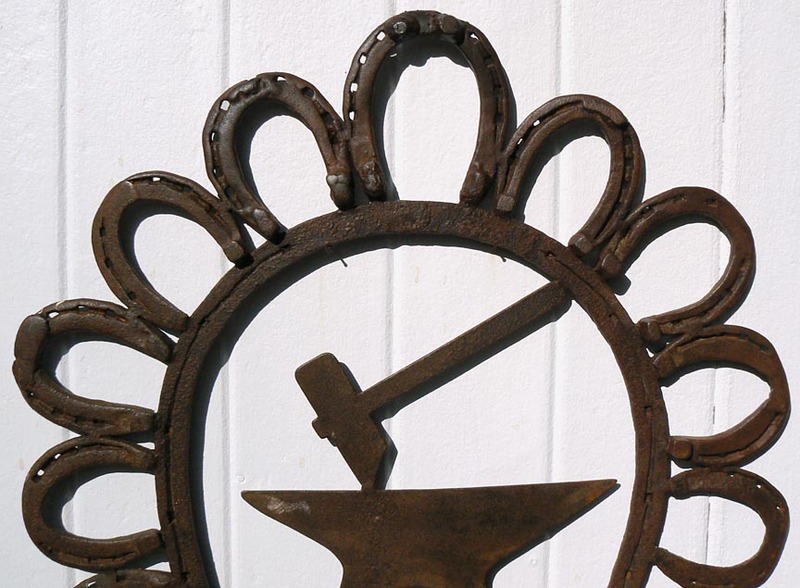 When we add any antiques or folk art to the site. This will include signs and banners.